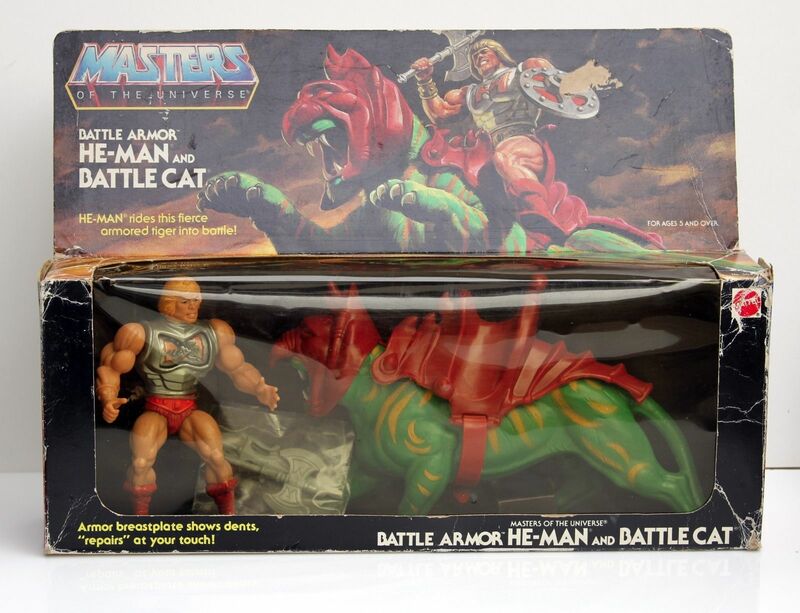 After a sibling destroyed my original He-Man figure (don’t ask), my mother replaced him (the figure, not my sibling) with a new version: Battle Armor He-Man. 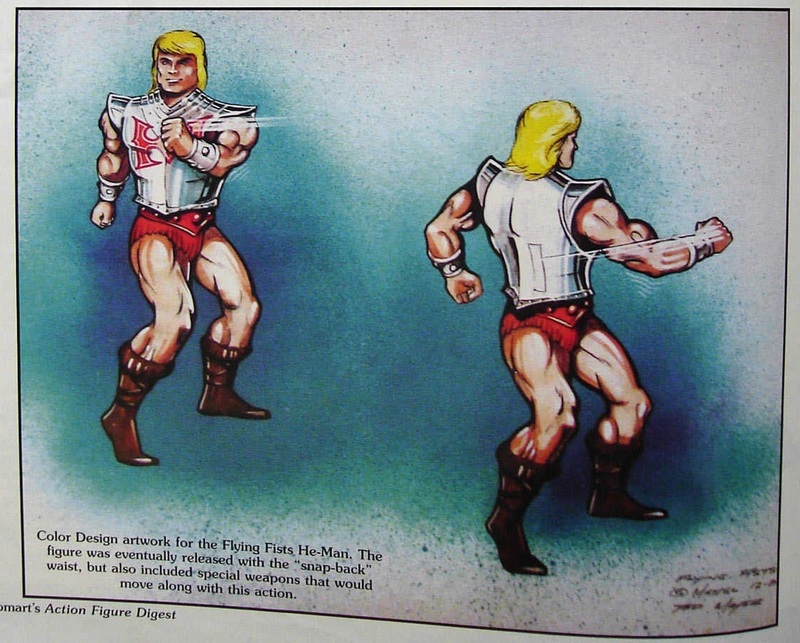 With this new variant, He-Man’s power harness was replaced by plate mail that you could “damage” with a touch and then “repair” with a flick of your finger. 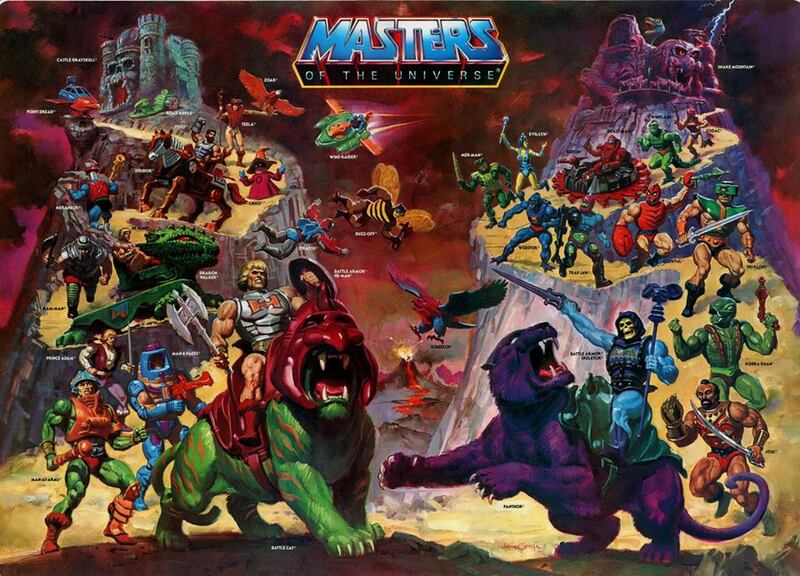 It was an ingenious action feature that provided me with hours and hours of entertainment, although I never quite got over the loss of my original He-Man until I was able to purchase one 30 years later. 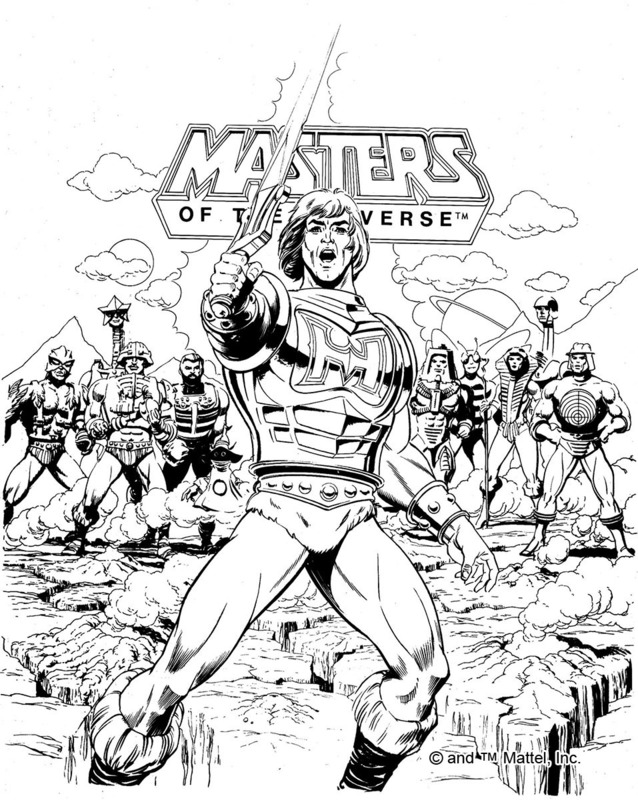 In this undated drawing, which I believe was also done by Ted Mayer, He-Man’s armor has the overlapping plated look of the final armor, albeit without the H.
The stylized H used on Battle-Armor He-Man’s chest also appears on Thunder Punch He-Man, Flying Fists He-Man, and on the side of the Dragon Walker. 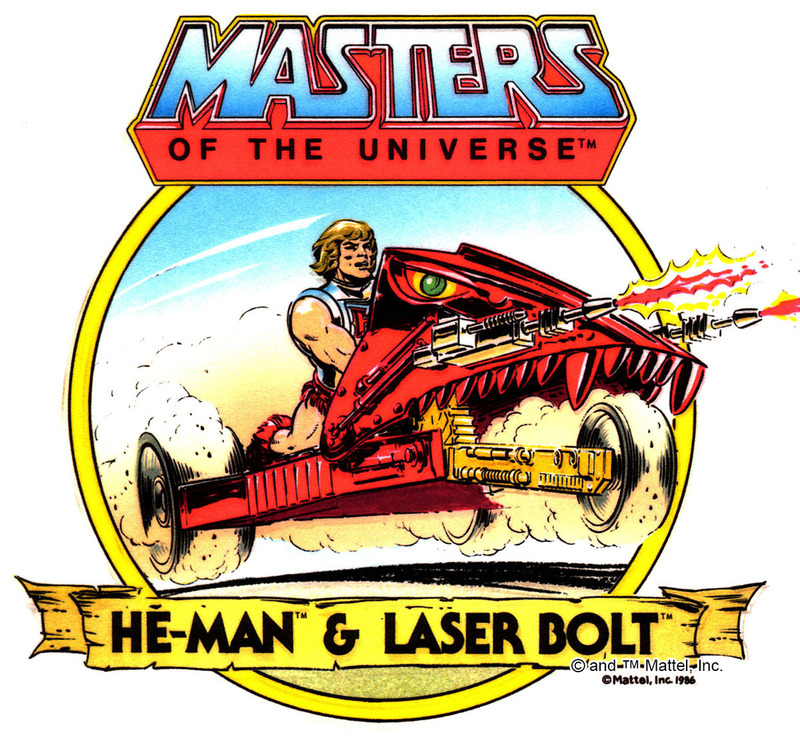 Laser Power He-Man uses a plainer H design. 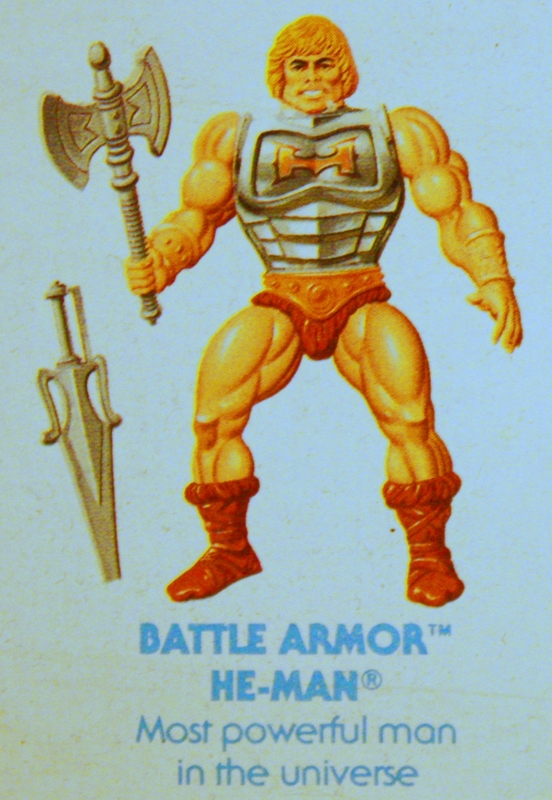 An early prototype for Battle Armor He-Man shows up in Mattel’s 1984 Dealer Catalog, as well as in the commercial featured near the beginning of this article. 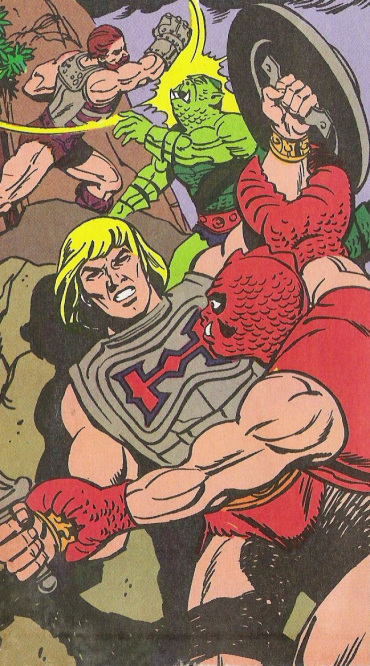 This version of Battle Armor He-Man has a bright red H on his chest with a dark red outline. 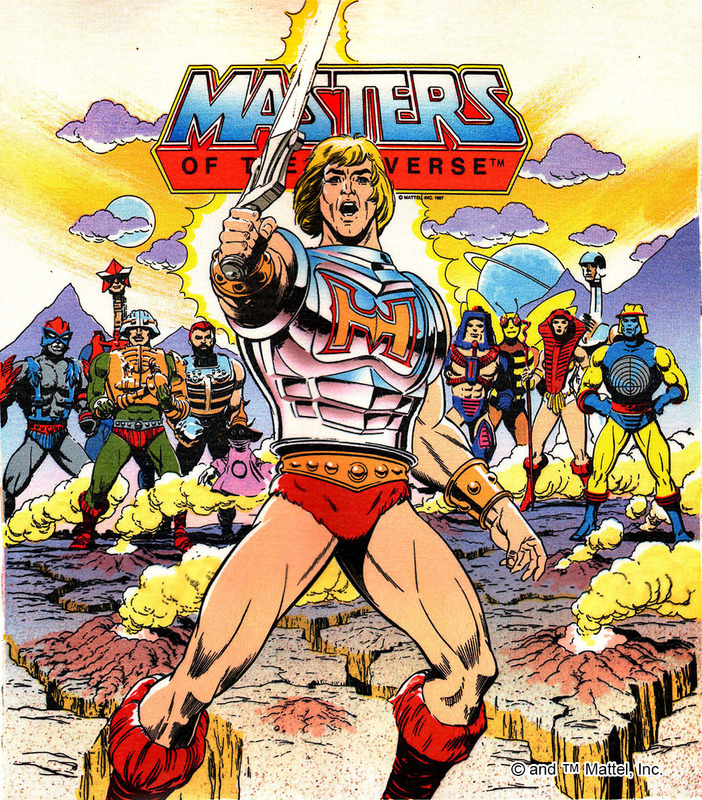 He also has quite dark red boots and loin cloth. 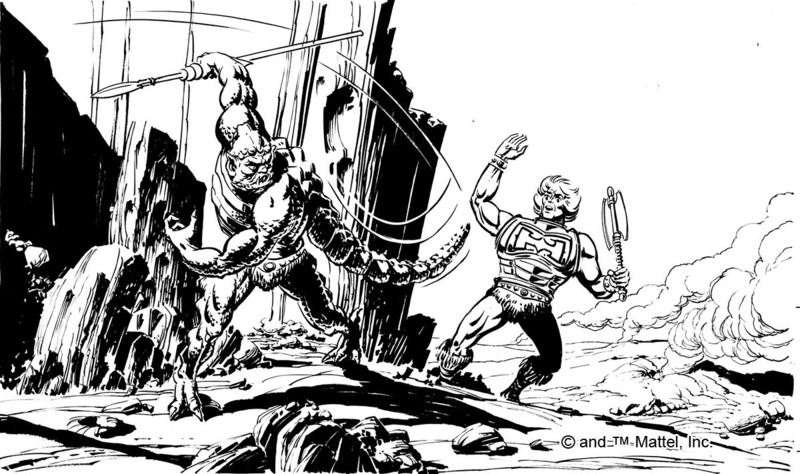 His weapons look like they’ve been painted with a very shiny coat of metallic silver. 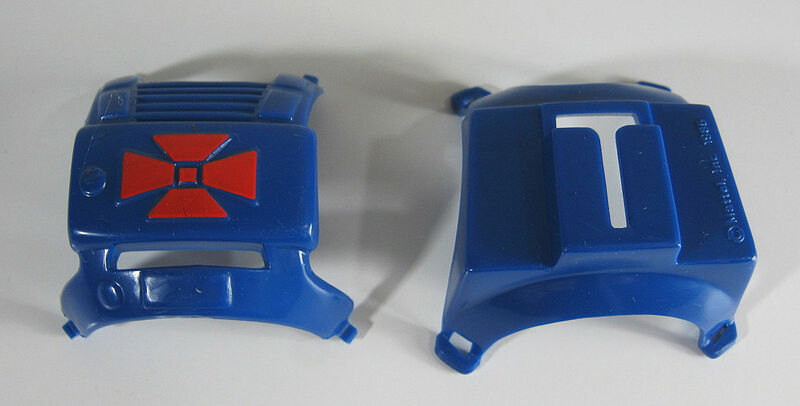 The production version (at least the initial Taiwan release] is a bit different from the prototype. 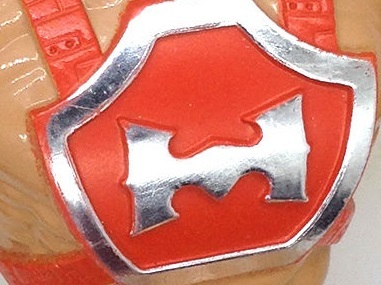 The H is salmon-orange rather than red, and his boots and loin cloth are a bit brighter. 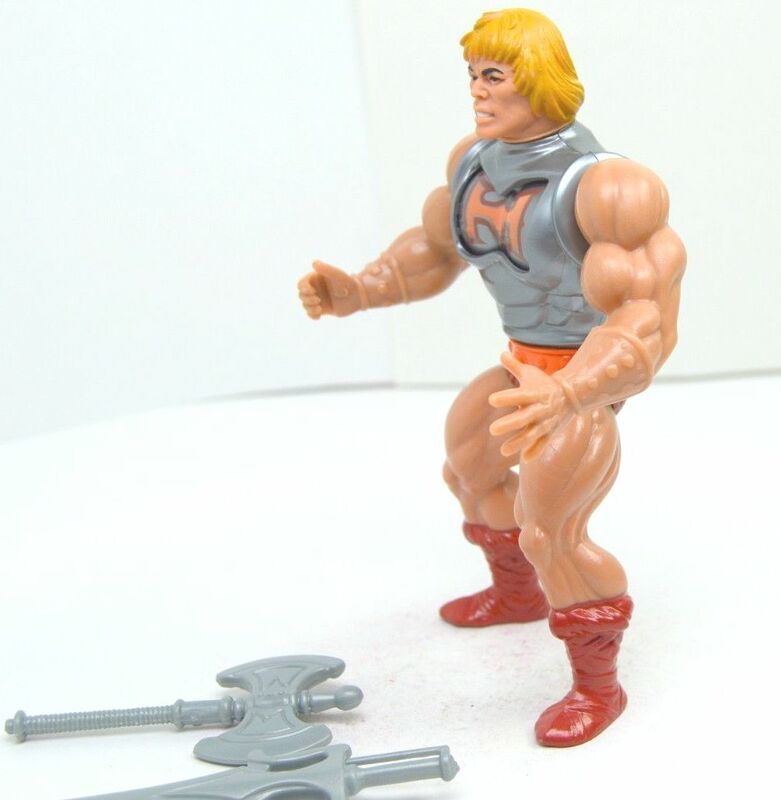 His weapons are more metallic-looking than the original release He-Man’s weapons, but not nearly as shiny as the prototype. 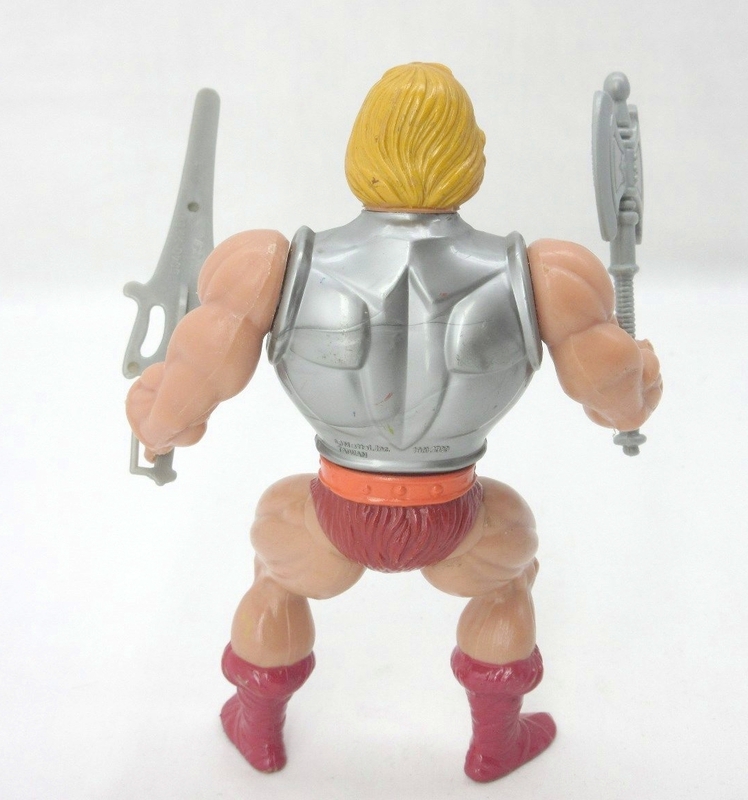 Unlike the original He-Man, he lacks a shield. 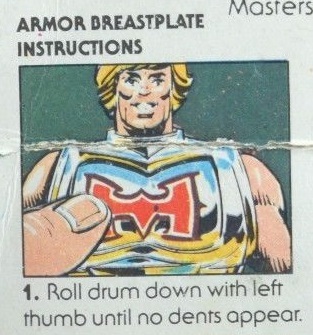 The front of He-Man’s card has a burst describing the function of the action feature. 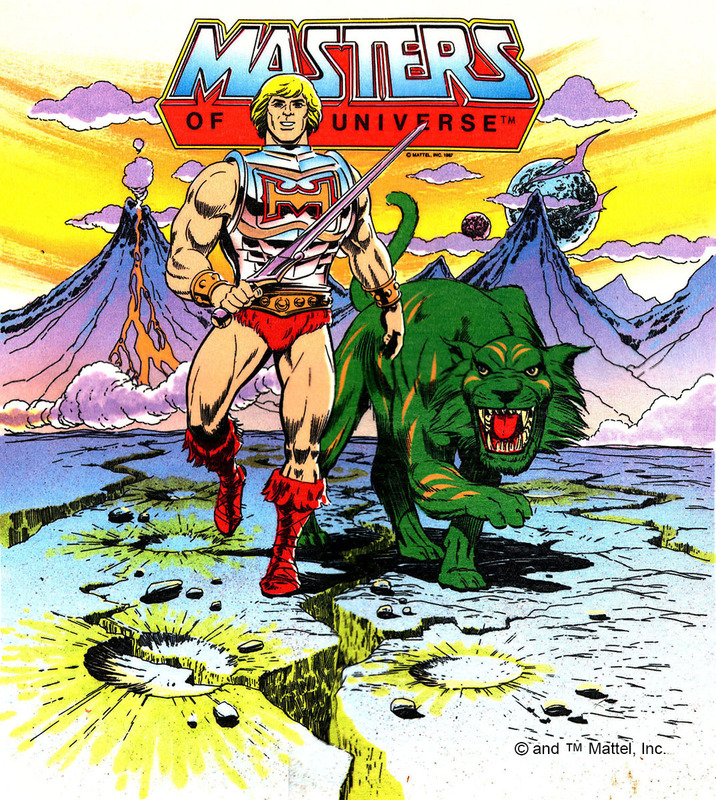 Unlike most figures released in the toy line, there is no tag line underneath He-Man’s name, although he is tagged with “Most powerful man in the universe” when he appears in cross sell artwork. 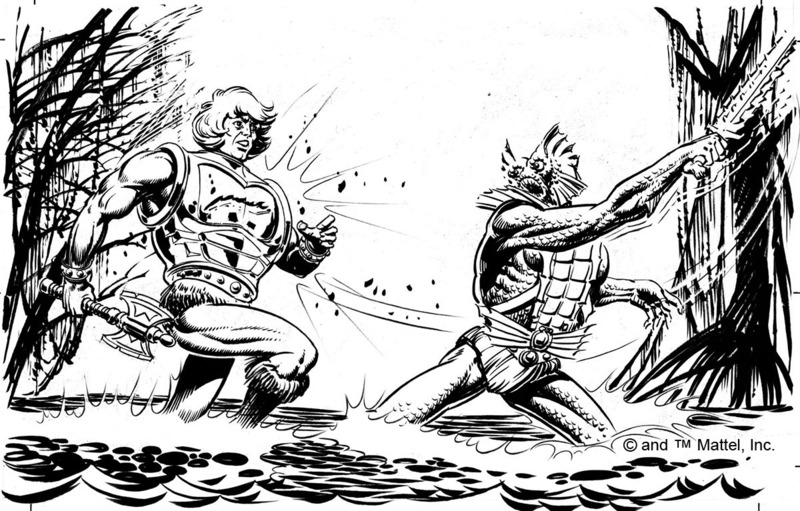 The cardback features a scene illustrated by Errol McCarthy, with Mer-Man giving He-Man’s armor a good slice with his sword. 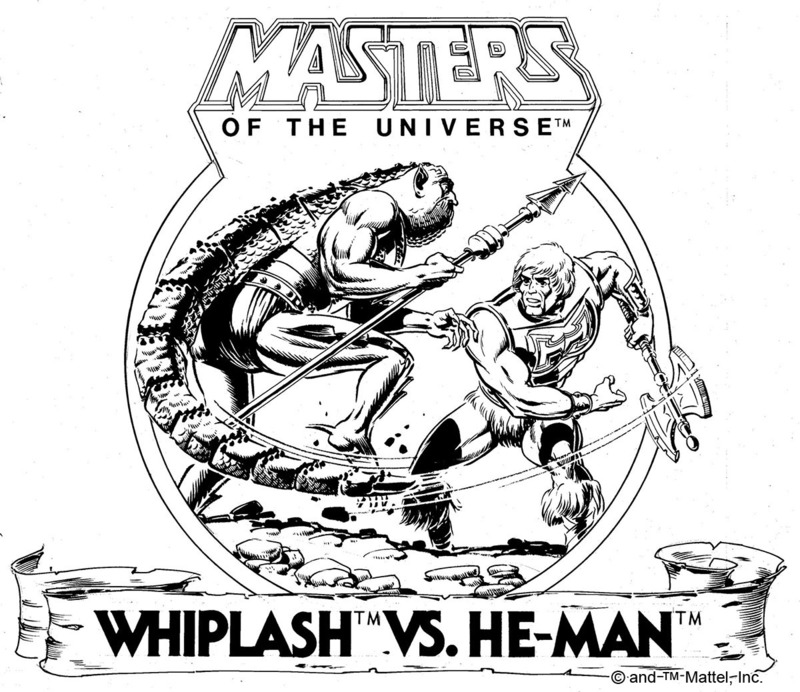 There is also an illustration demonstrating how He-Man’s action feature works. 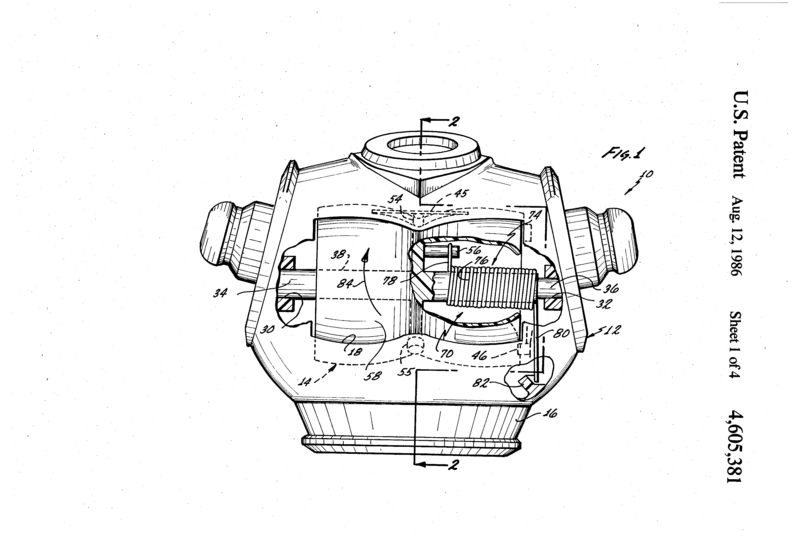 An animated figure toy of the type which includes an upper torso having a chest drum rotatably mounted in a chest opening for sequential rotation to expose an undamaged section, a single damaged section and a double damaged section is provided with an improved multiple-force spring. 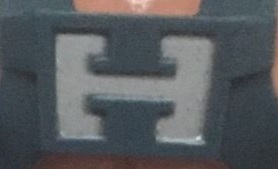 So essentially, a small amount of pressure will cause the chest drum to rotate forward one click, exposing an H that appears to have a slash on it, and then another H with two slashes. 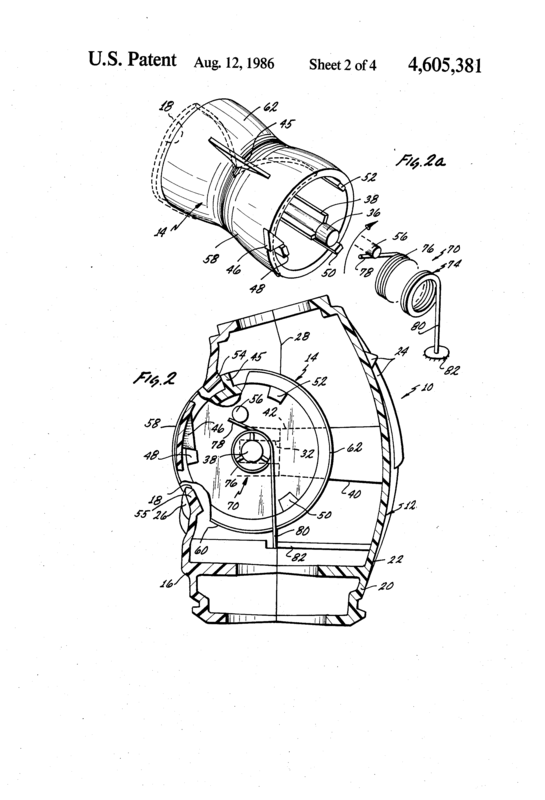 You can then manually turn the drum back to the start and begin all over again. 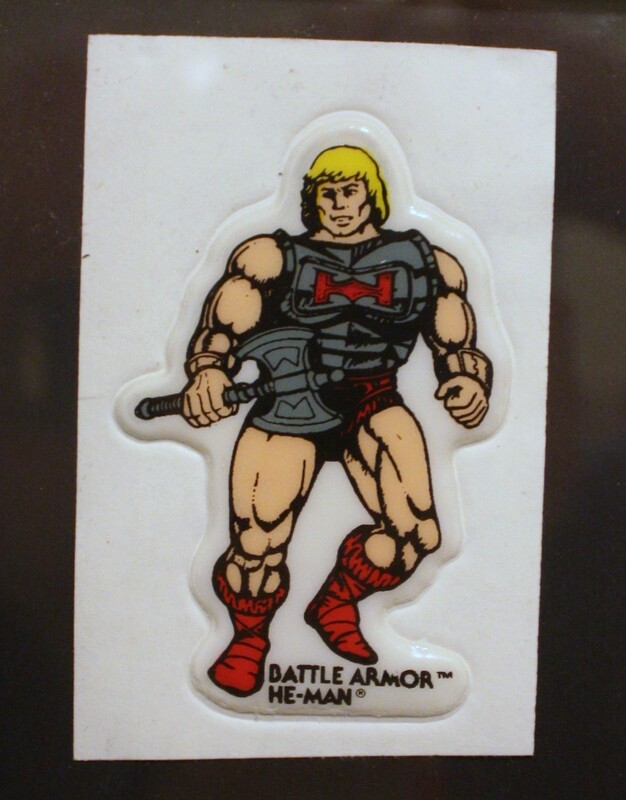 Battle Armor He-Man also appears in various Stickers, story books, collectibles, and other media. 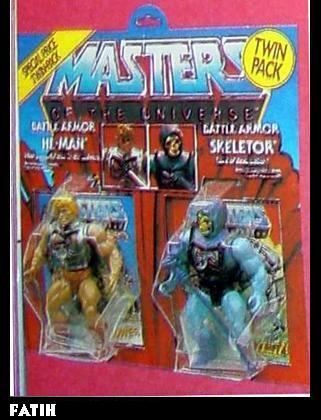 I remember getting both BA He man and Skelly on a family holiday from a seaside shop in Devon. 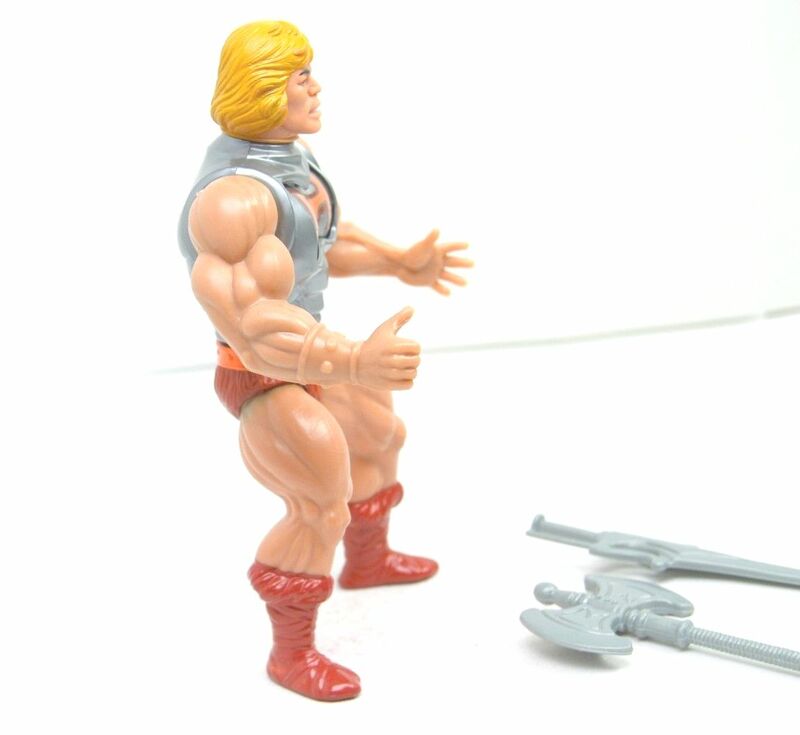 Both figures came together on a double card twin pack and im sure Mattel never packaged their figures in this way again. 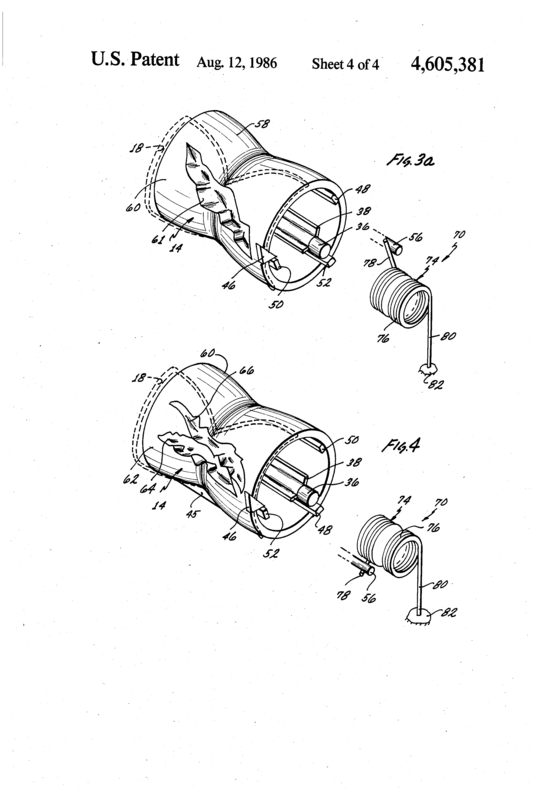 … great research, once again. 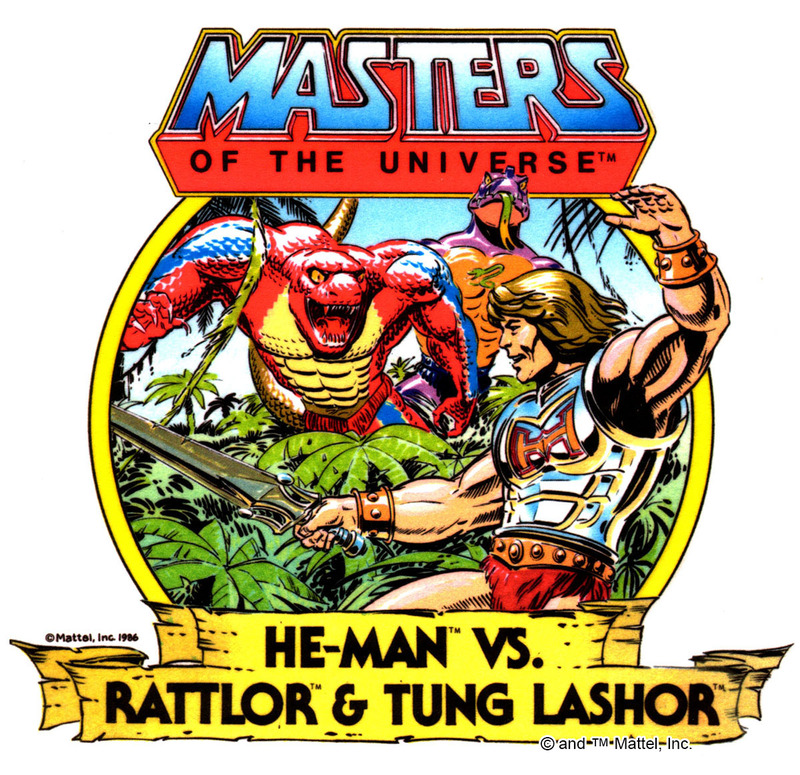 BA He-Man really made me all excited once it came out back then. 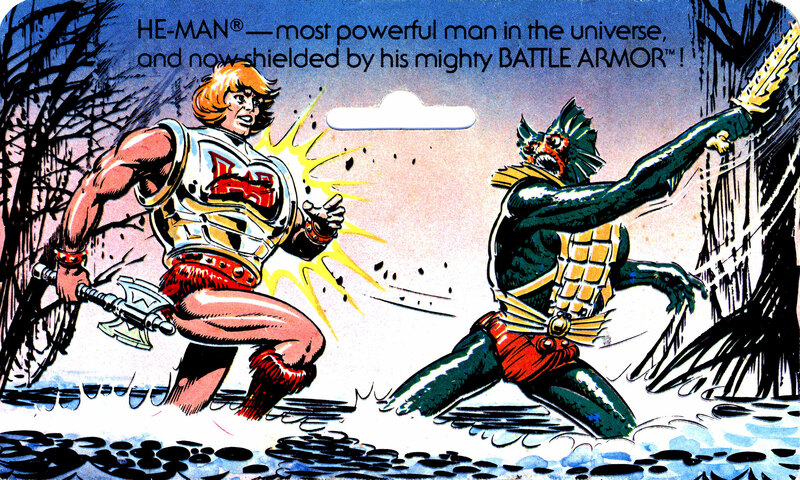 This is the essence of Motu: making the armor look/ work futuristic (the damage function and the “self-healing” power within that armor) and at the same time appeal to a classic theme (the knight-armor thing). Awesome. 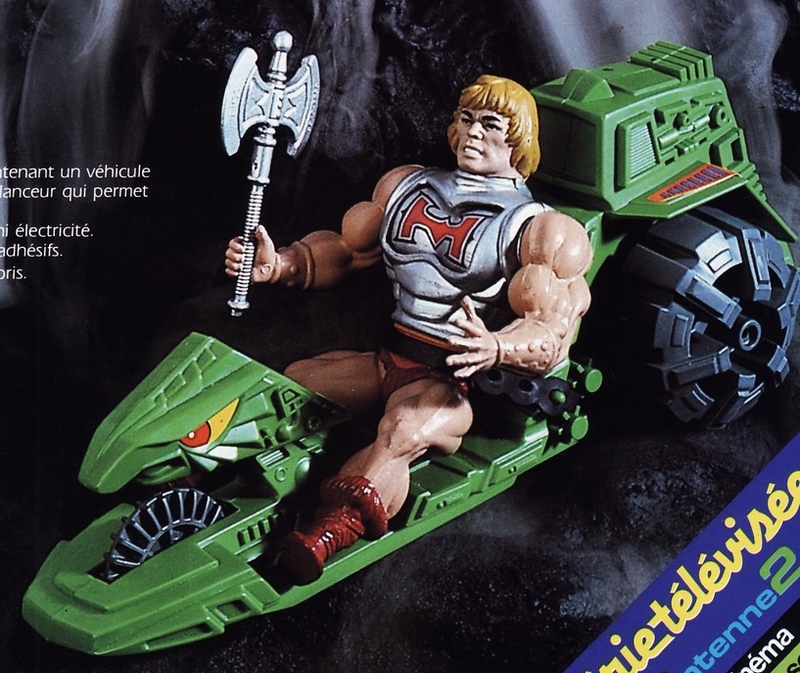 I like the French Version of BA He-Man. 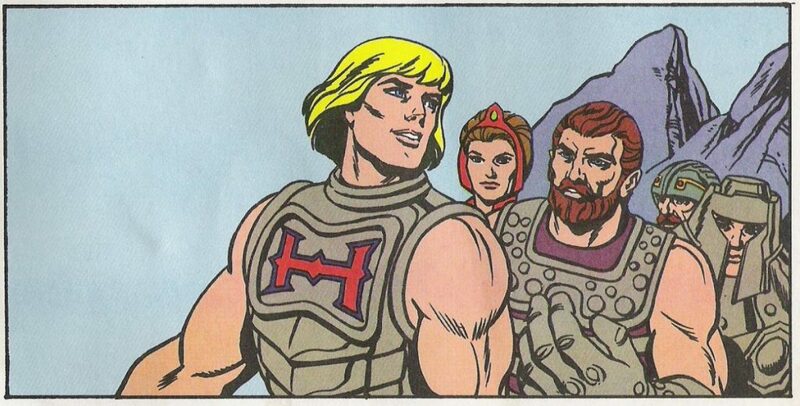 Bright colors (hair, Boots) and shiny armor. 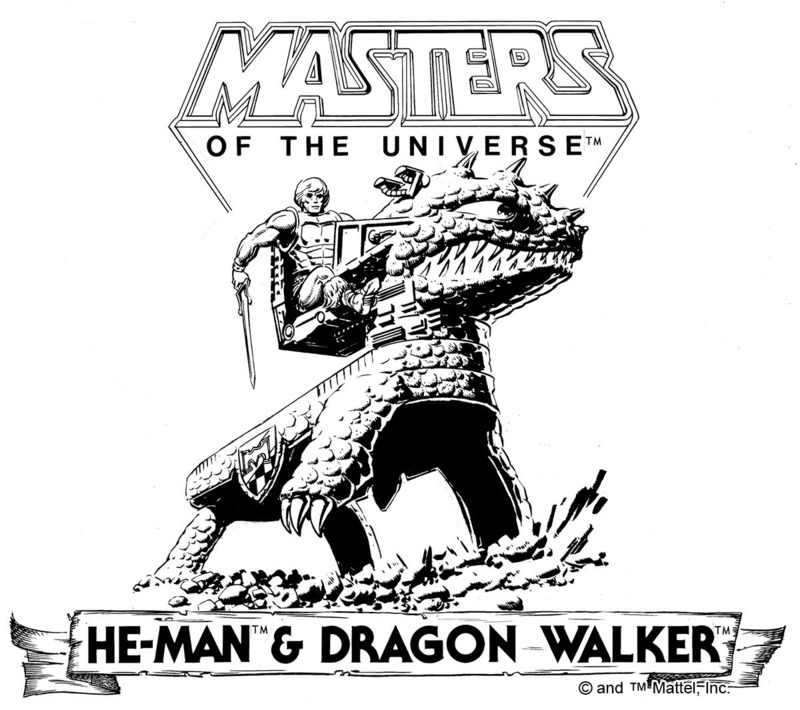 Great read once again! 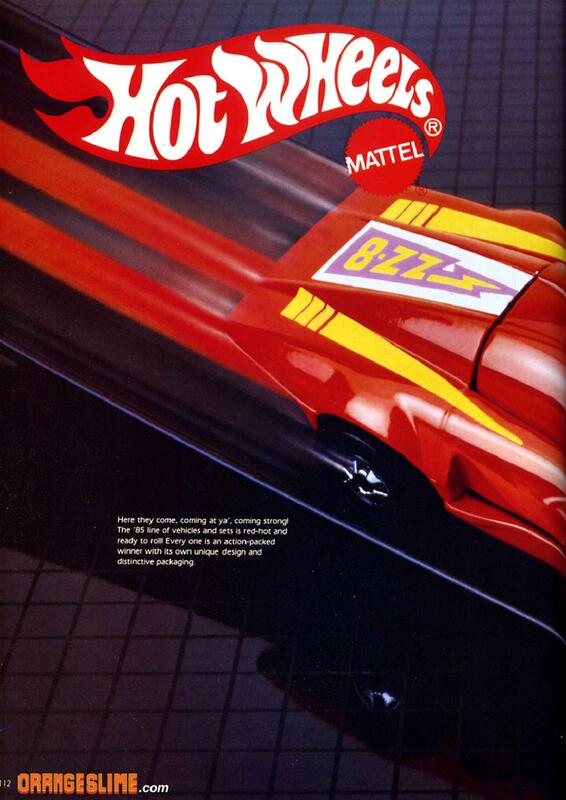 Thank you for providing such amazing insights about the brand is grew up loving as a kid. 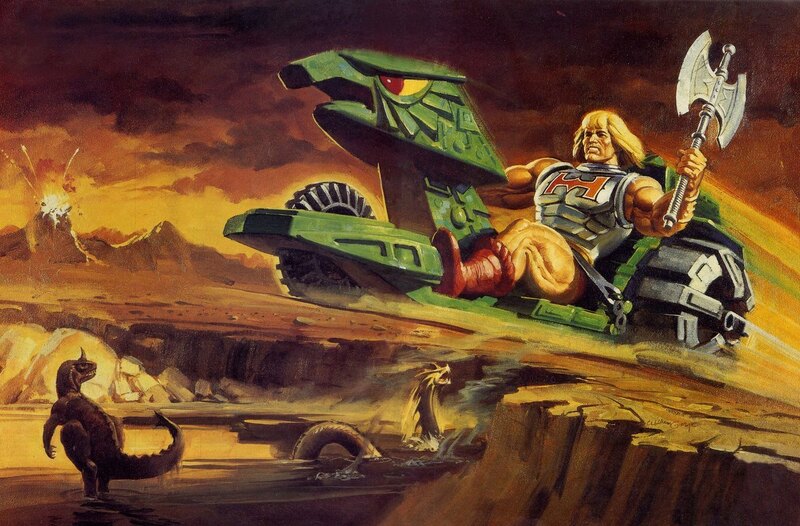 HE-MAN is awesome. Great research as always. 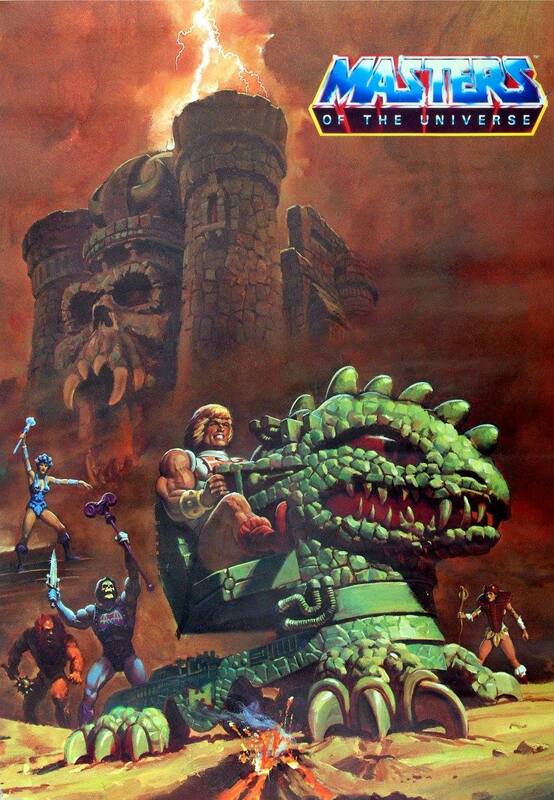 BA He Man was my first He man. He came to me from Germany in an extremely nice card…. 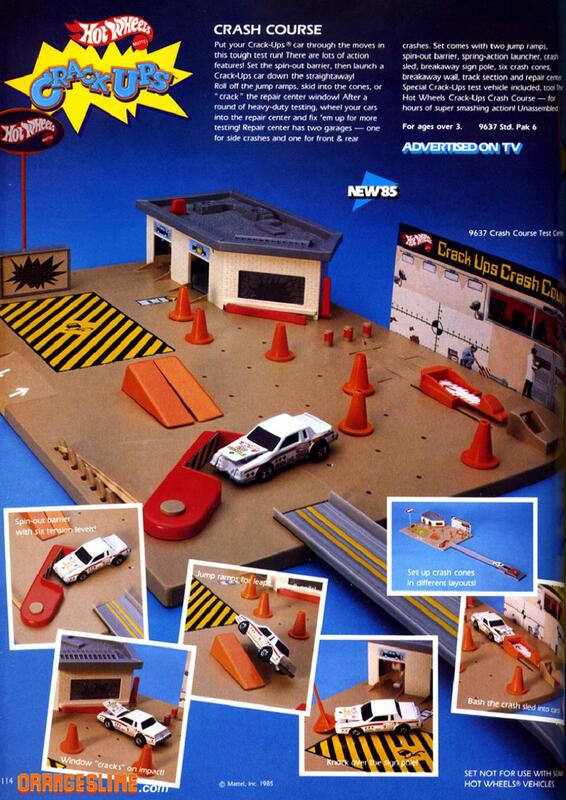 On the top left corner had a little game. 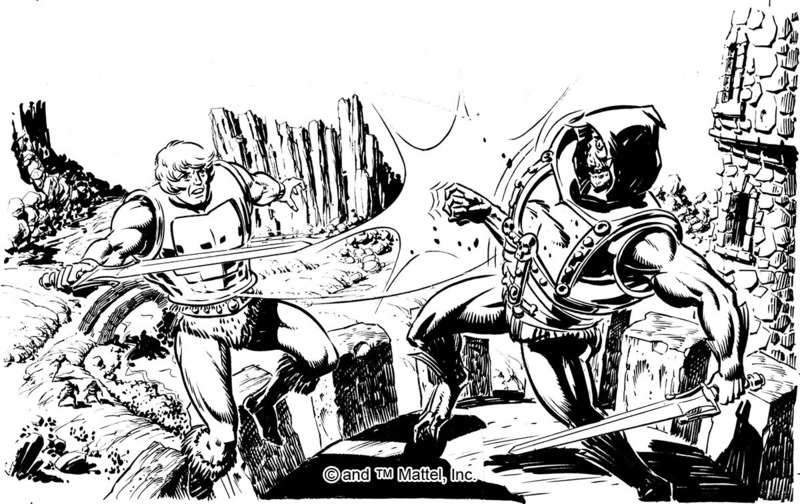 A rounded card, that could be turned and give he man the one or two cracks on his armour…. Inside the package was a great double faced paper mask. 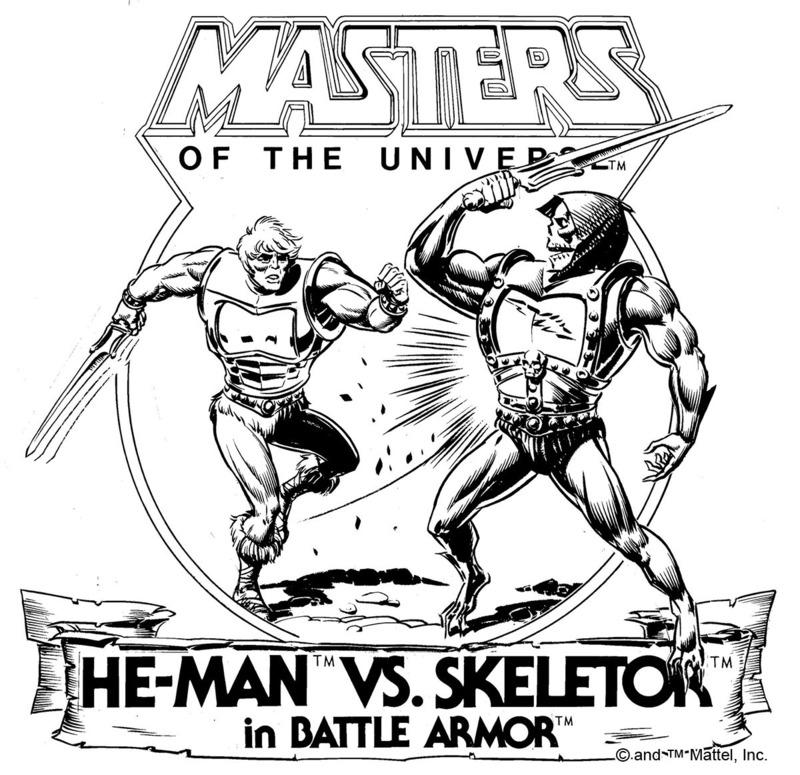 Face A was He Man , Face B was old Skelly. Magic. I can not post a foto here, but if you google- search “zauberhe he man” you will see a foto of this card. 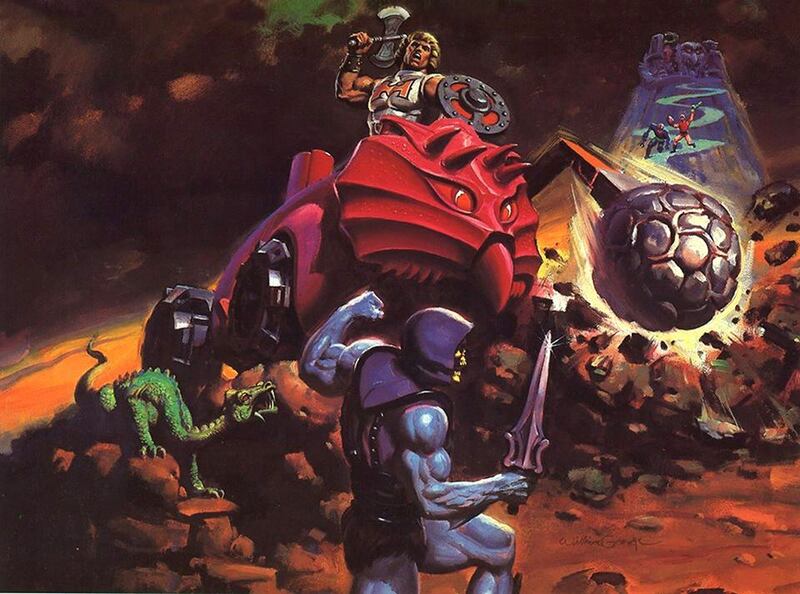 Love the Battle for Eternia Game art work. 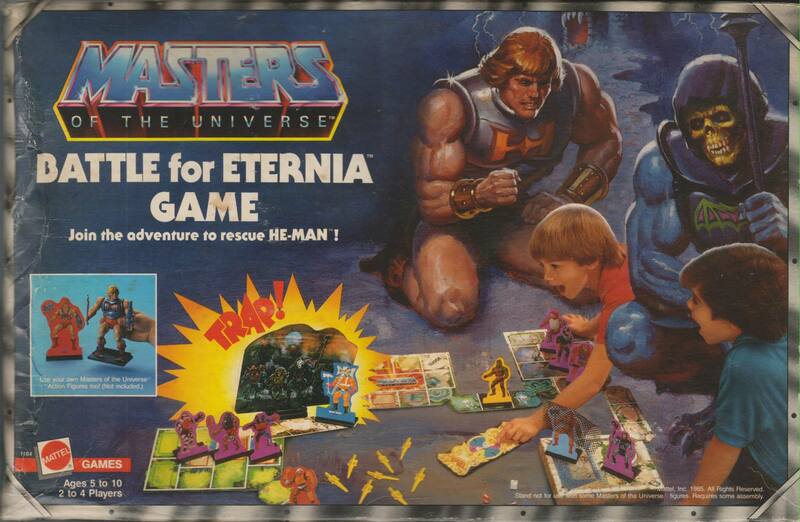 It looks like He-man and Skelly have downed weapons and put a wager on the kids. 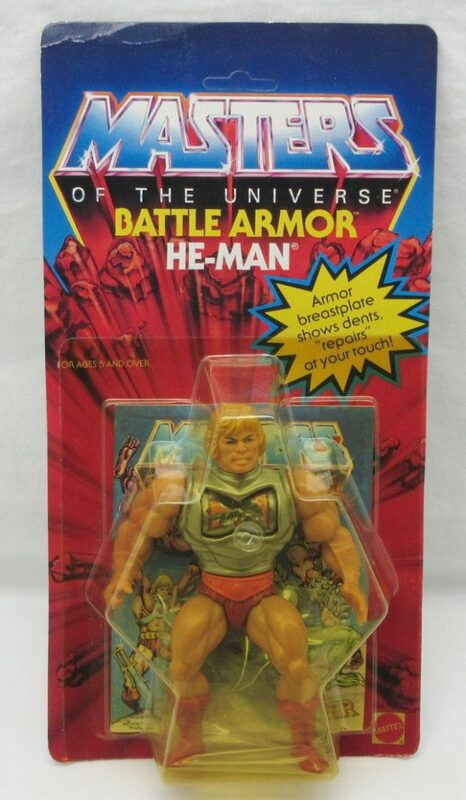 While it was a good gimmick that has been used quite a bit these days with tweaks (like completely turning around without the need for resetting), I kinda feel the gimmick comes off as weird.. “Hey, I got this Mighty Strong new Battle Armour!, How is it different from the old armour? This one takes Damage!”.. sure, it heals but.. since his original armour was often say to make him almost invincible, larger armour which now takes damage seams a bit.. weird.. 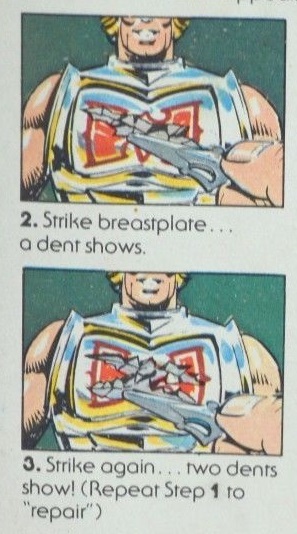 I never thought of the armor as actually being self-healing. 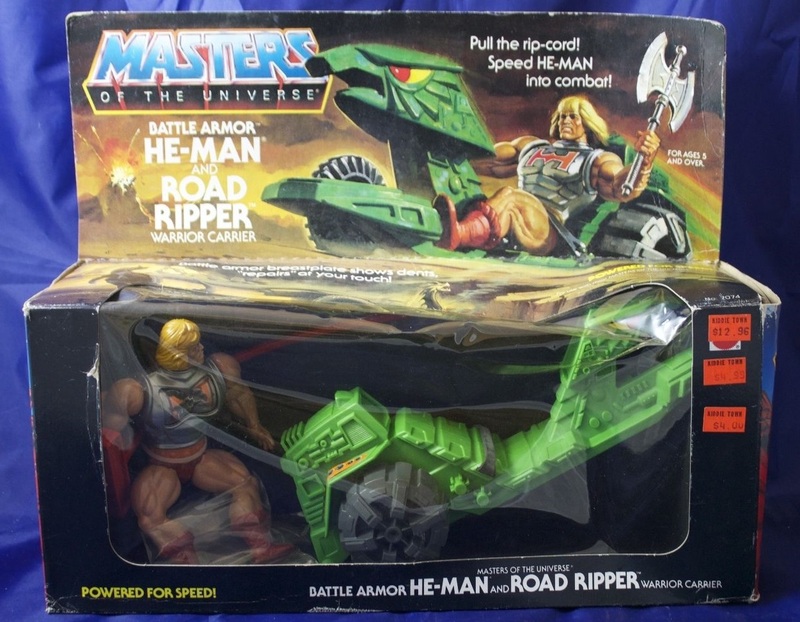 In my mind it just allowed you to have some battle damage on He-Man’s armor. Then you could just start over again from scratch. 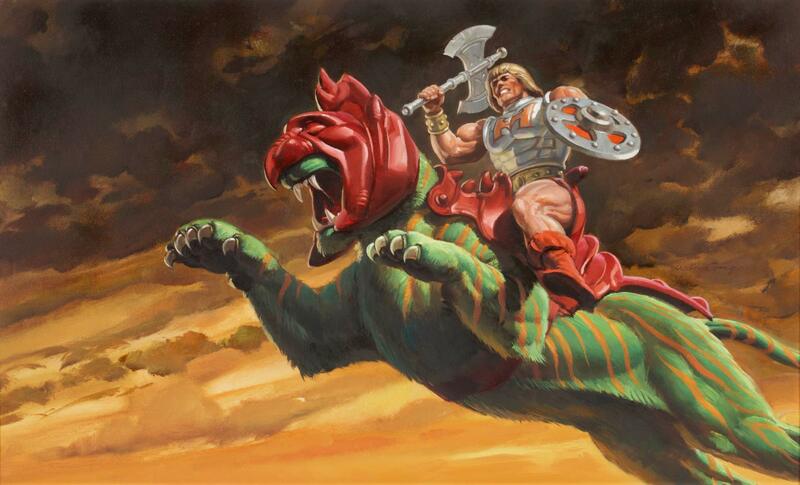 Maybe He-Man went home and replaced his old armor with a new set. 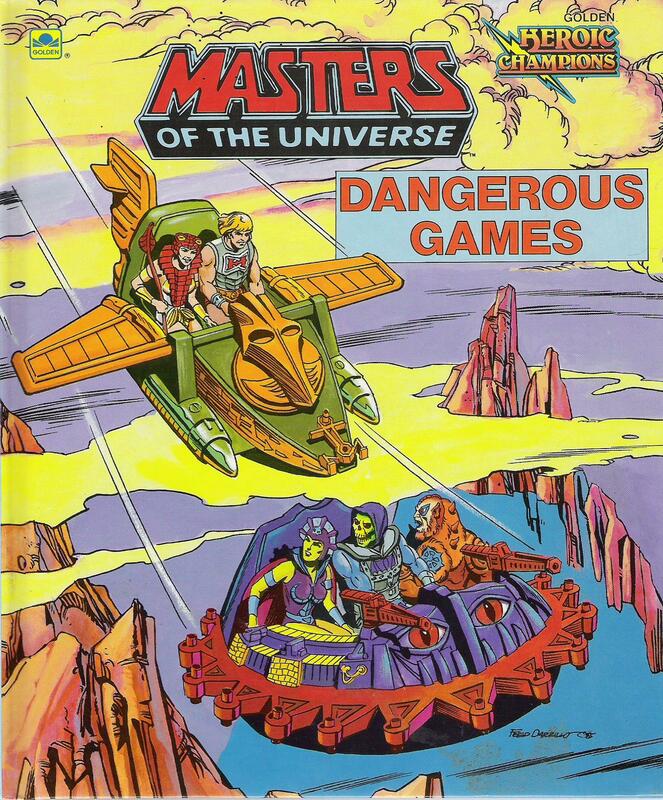 Sure, it doesn’t make a lot of sense, but it entertained me for hours. 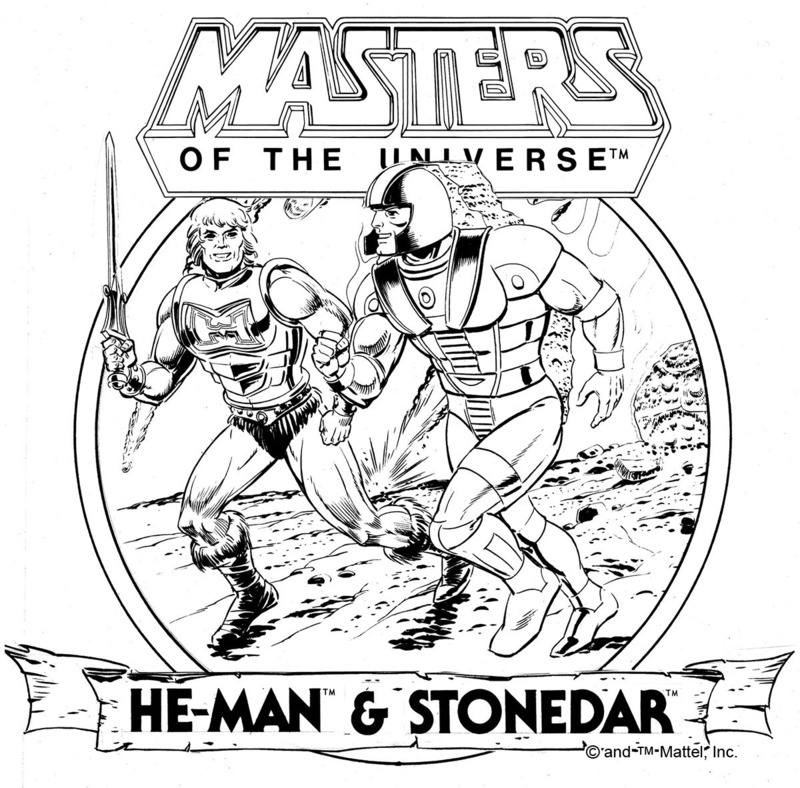 It was a bummer for me that BA never appeared on the cartoon. 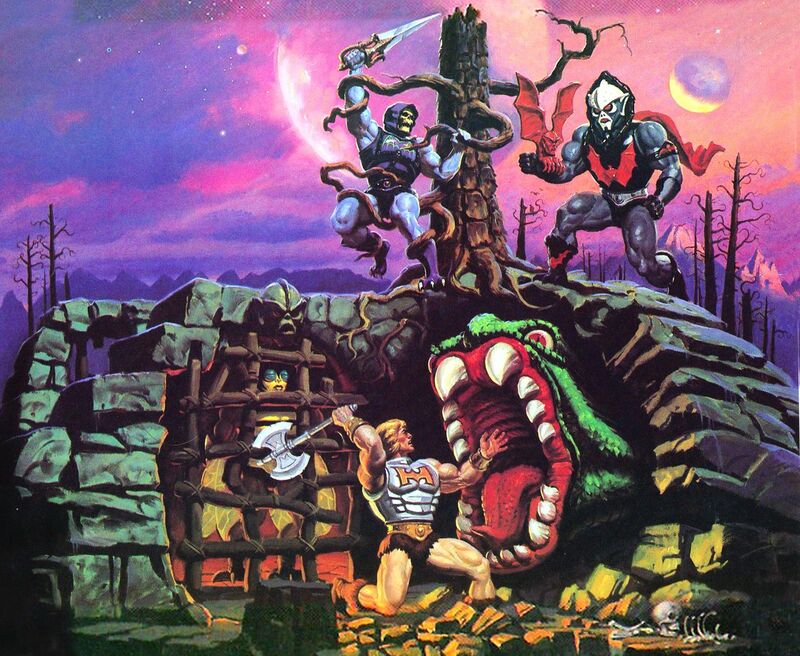 I’m sure you’ve heard this before, but you have produced a wonderful resource for fans. 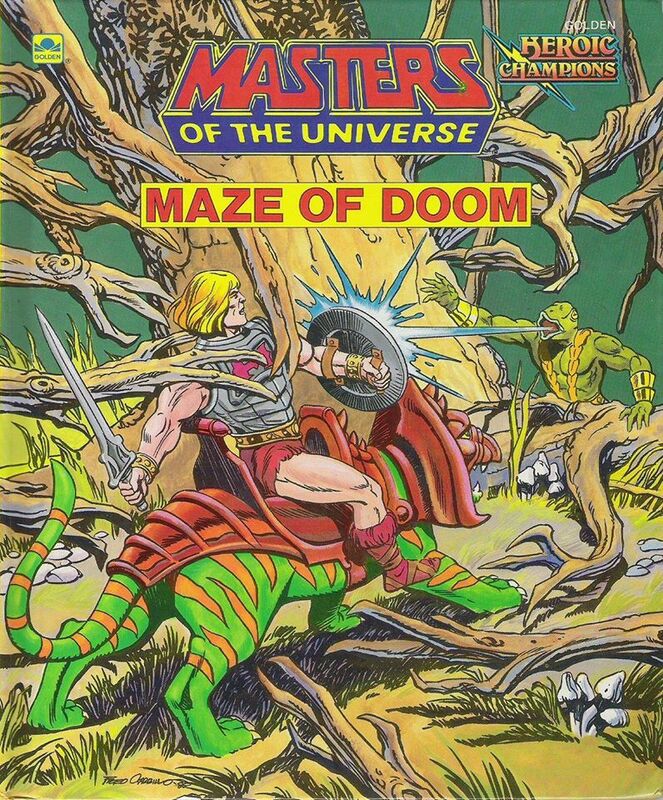 I’ve been reading the DK MOTU books over the past couple years, and while I appreciate each in its own way, they have not really covered the toys and their history. Your archive is the book we’ve been missing. 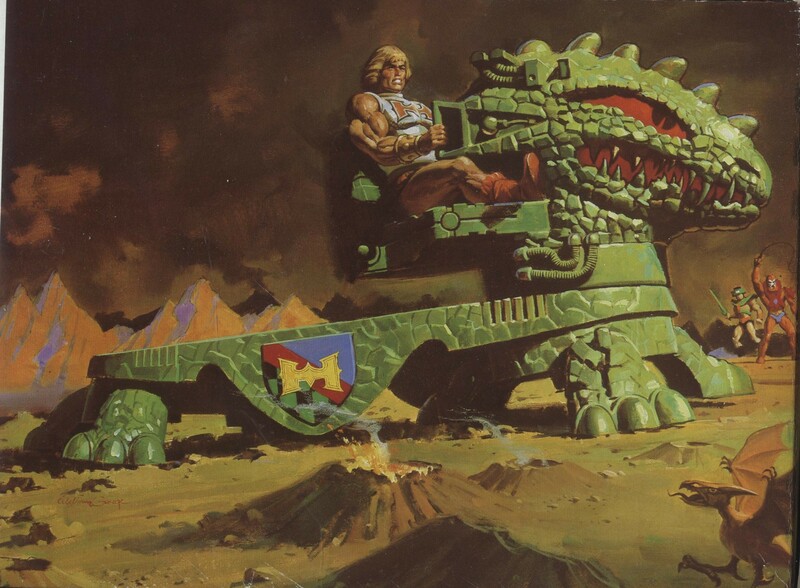 I hope you’ve contacted the publishers with the idea to publish the content you’ve created/curated. 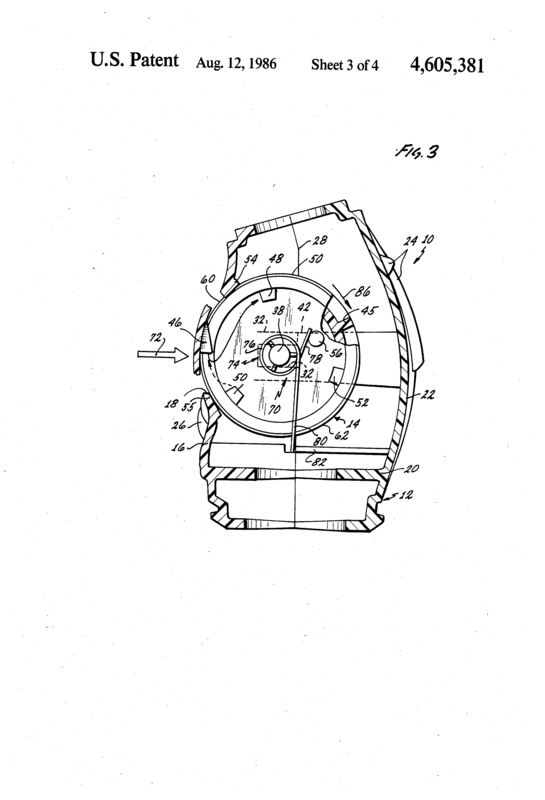 I hope I’m behind the times and a book is already in the works. Thank you for what you continue to provide. Thanks Ryan, I appreciate that! 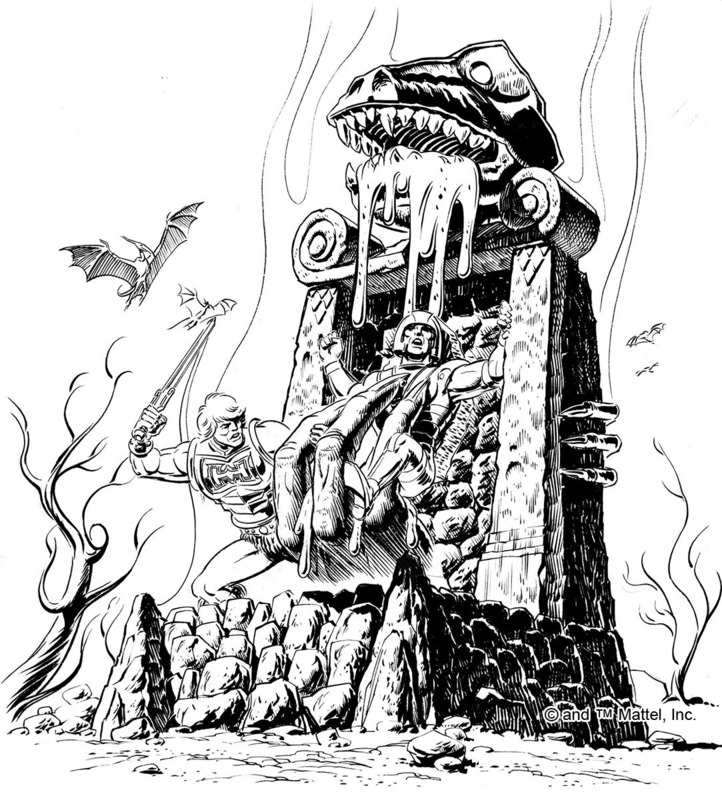 Getting the blog made into a book would be rather complicated by certain factors, but I’d love if someday it could happen. 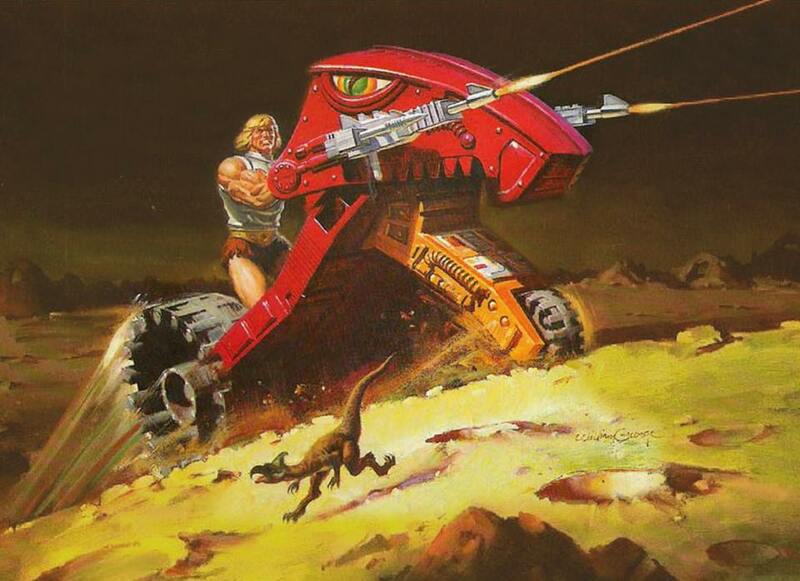 Perhaps the armor fixes itself using nano-bots. 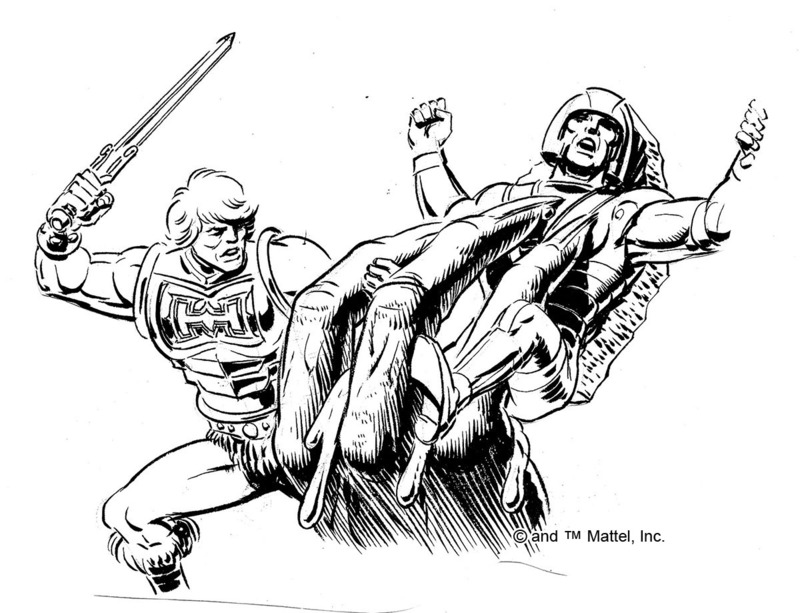 A possible foreshadowing to the next future Mattel action hero Max Steel! 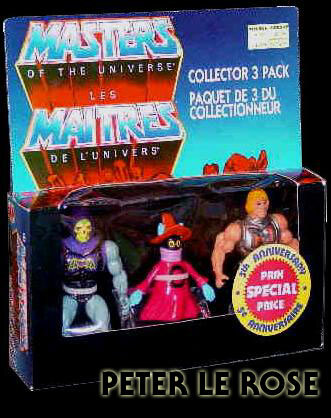 I have BA Skeletor but sadly I never had this He-Man. He’s definitely my favorite. 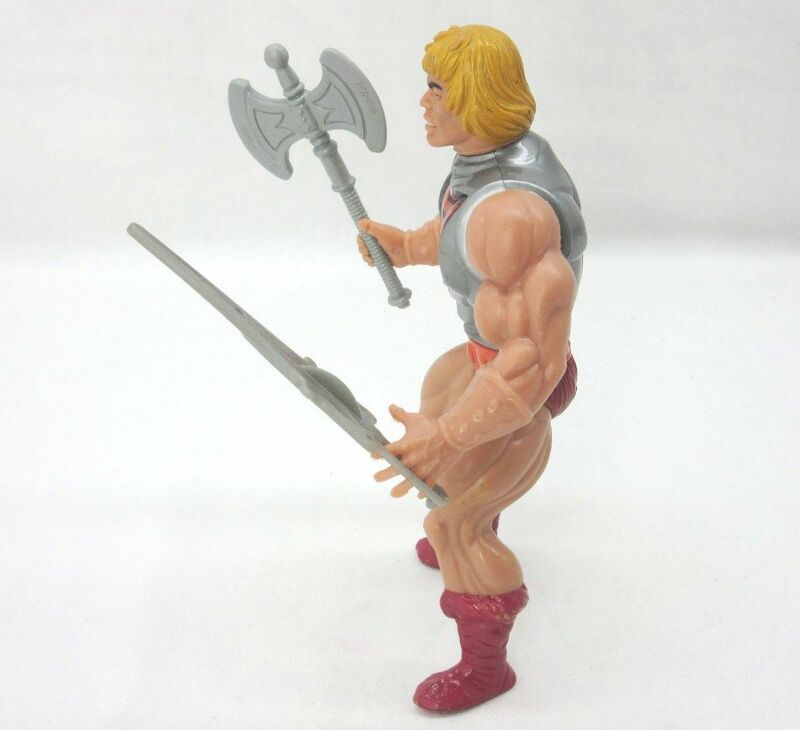 I like Thunder Punch He-Man but his new parts have a very soft sculpt, without the sharp details of the original work by Tony Guerrero. 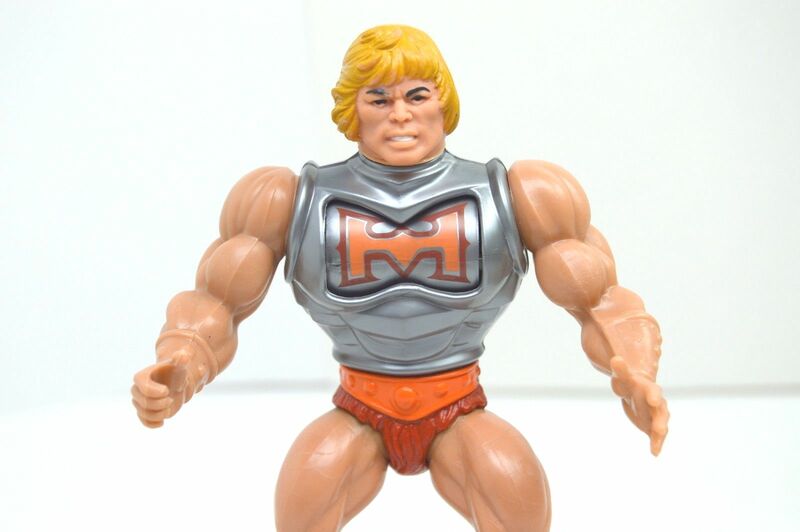 Flying Fists He-Man always looks weird to me, like a bootleg figure. 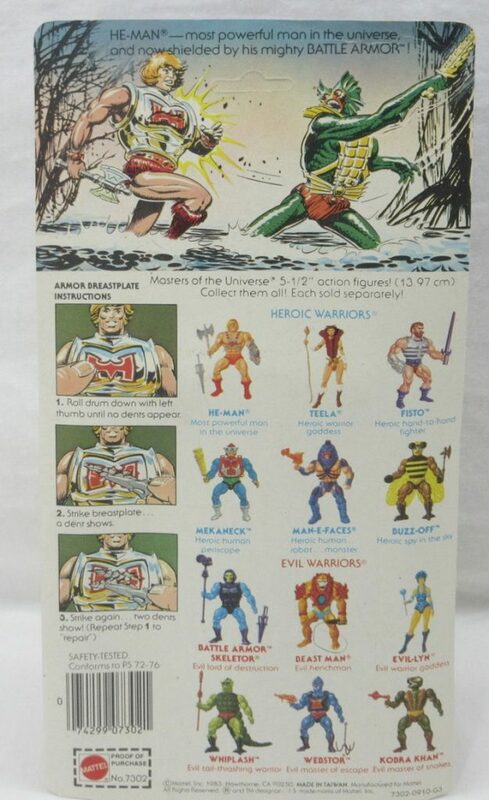 I never much cared for variants as a child – in my young head, “why should I spend my hard earned pocket money on a character I already have with different armor when I could get a whole new character!” (in fact the only variant I ever had was Flying Fists He-Man, purchased very late on in a “reduced to clear” sale, to replace by by-then very battered original He-Man) but ANYWAY… Battle Armor did actually seem fairly cool, and was likely the best, excluding the rare laser lights, of the variants. 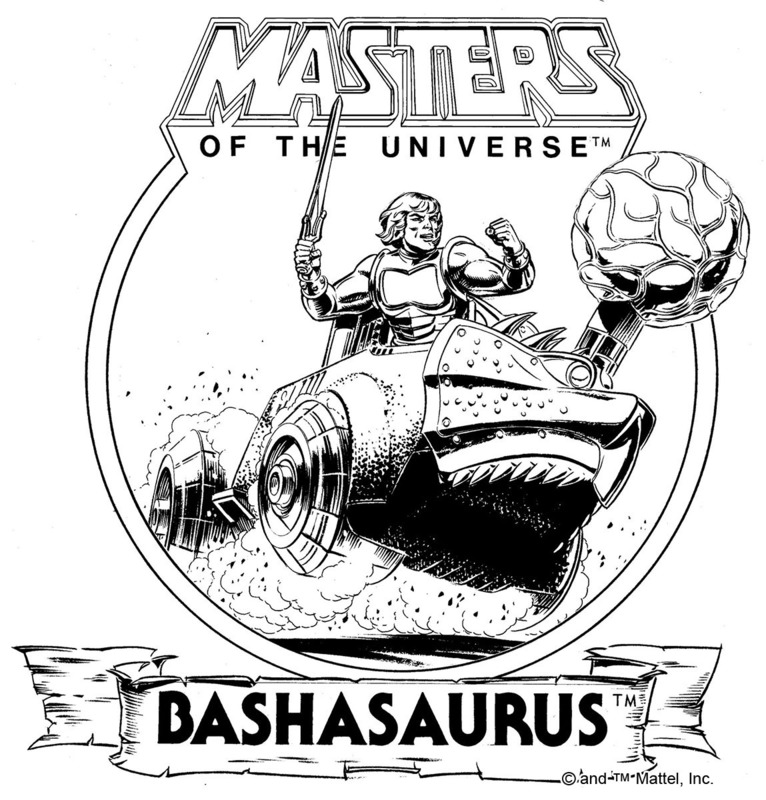 It’s odd that there was never any appearance of BA in the mini-comics (who usually loved to cover near characters and gimmicks, sometimes in the flimsiest stories imaginable!) 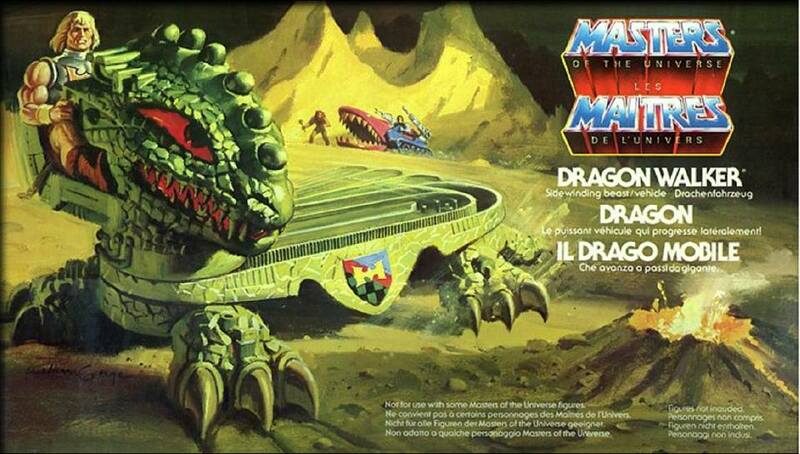 or indeed in the Filmation series, which was was only mid-run when the BAs were released. 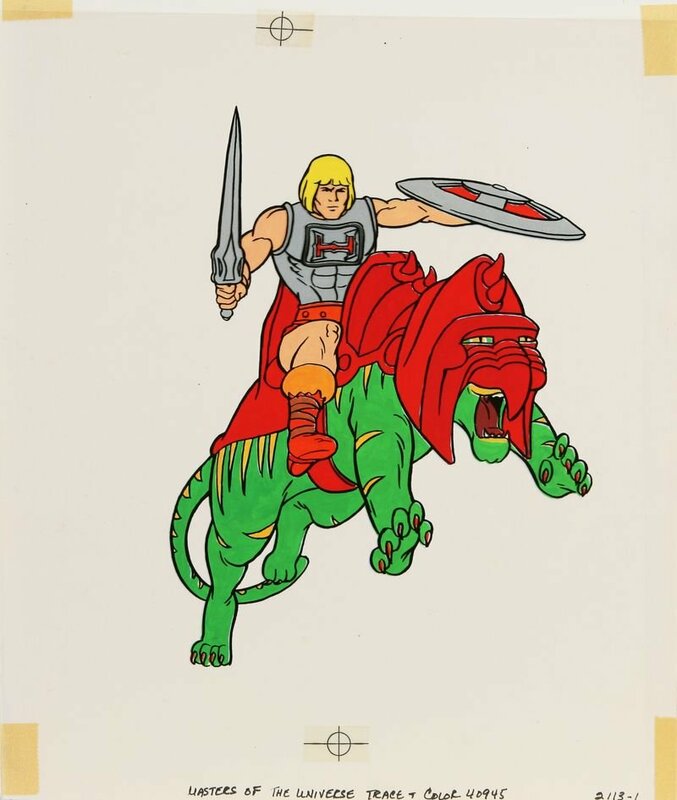 I always wondered as a boy would the transformation sequence into BA He-Man been the same and would he have to put his BA armor on afterwards… I thought weird things as a boy!) 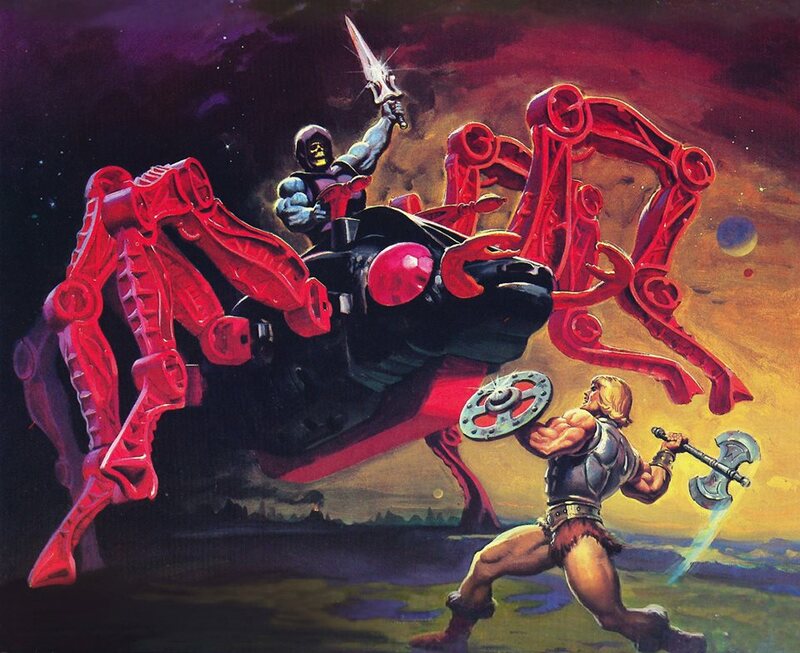 Looking back, I wonder if Filmation didn’t go with the BAs as it was a very combat-releated feature, which the famously tried to steer away from for much of the series. 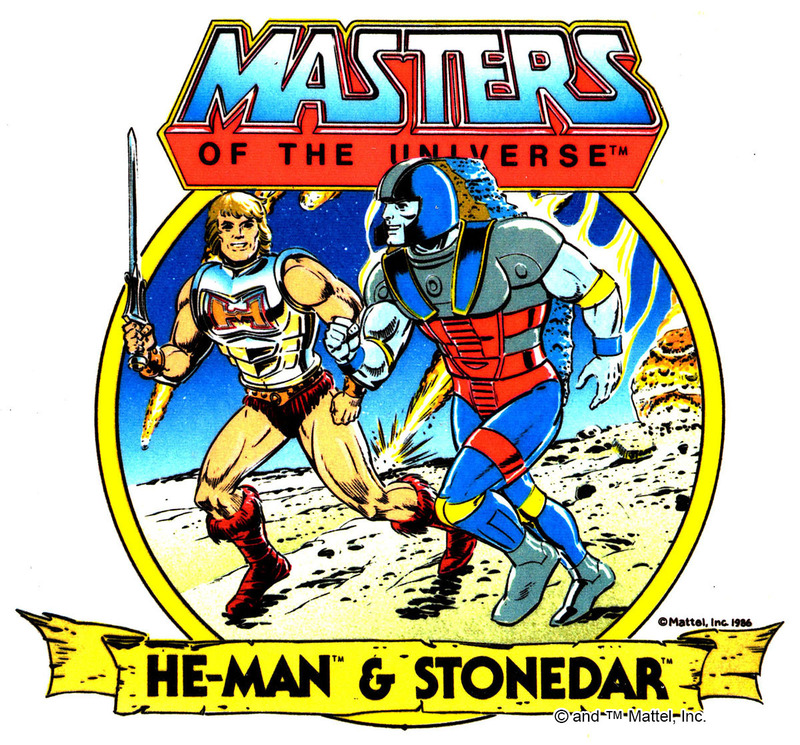 Oddly, in a way BA He-Man for some years came to represent an element of dislike from me. 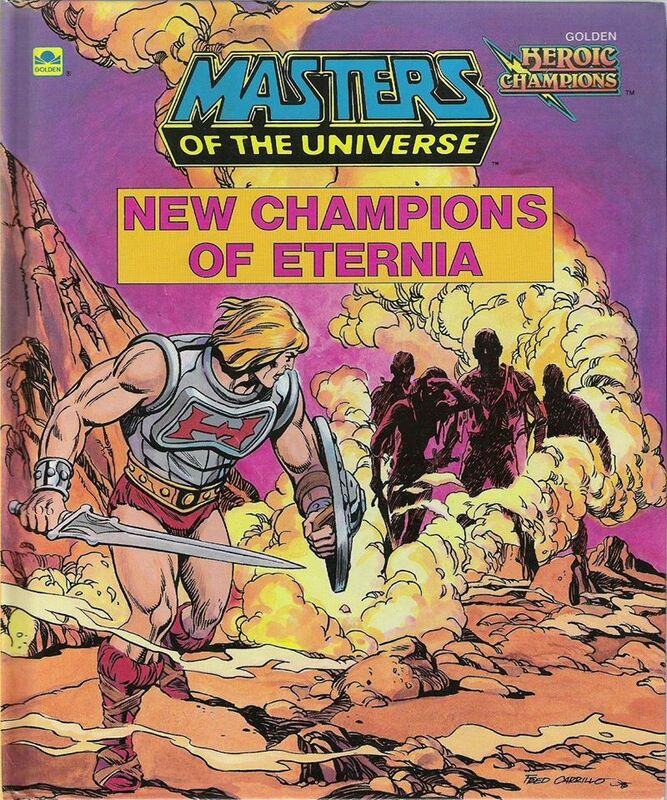 I *LOVED* the first two waves, and the early barbarian mythos. 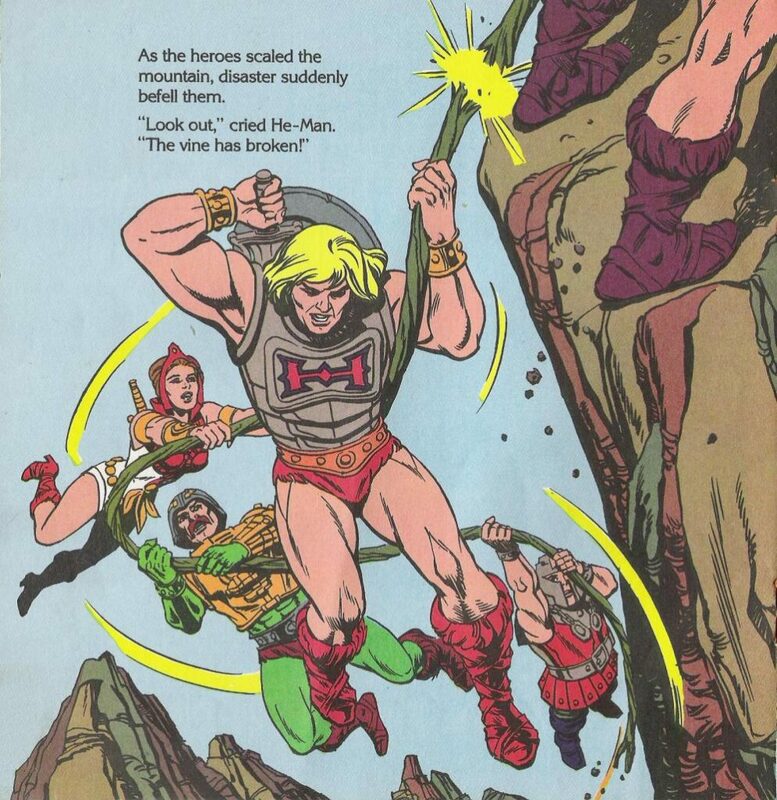 As the third wave came in, it marked a change of direction slightly – more gimmick over character, and more “anything goes” in terms of what was put into the line; as BA He-Man’s image was slapped over much of this it came to kinda “represent” that shift. 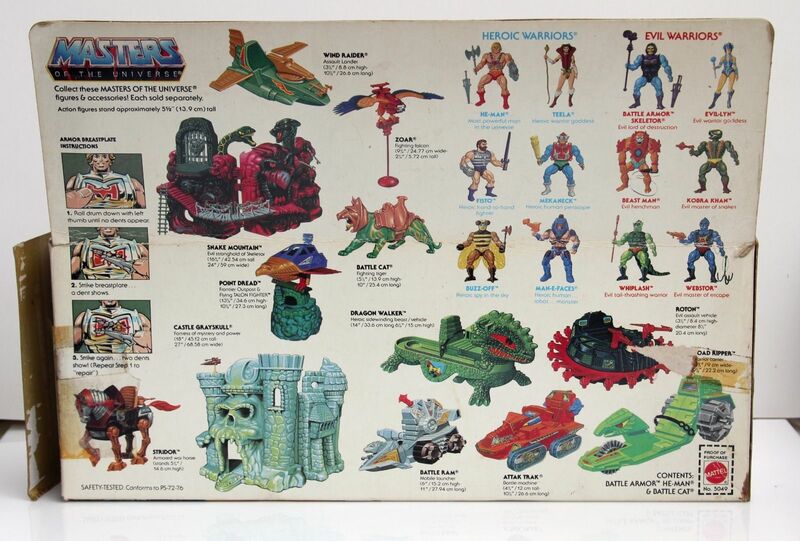 I still loved and collected MOTU, but I did yearn for those early, cooler days. 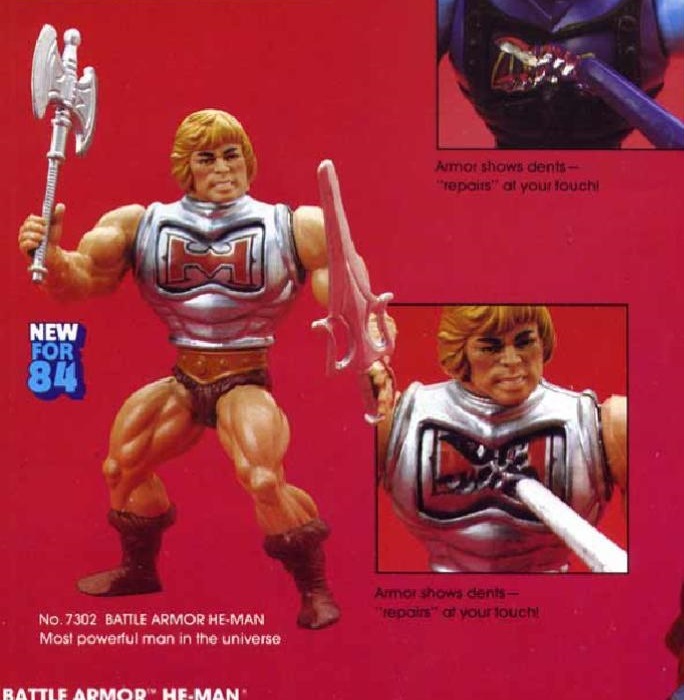 As time has passed I’ve warmed to BA He-Man more, and the figure does look pretty good. 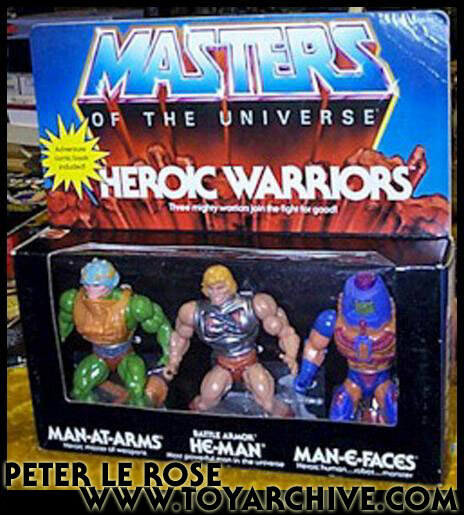 When I collected the complete line on the second hand market about ten years ago now (sadly since sold after times got hard… sob!) 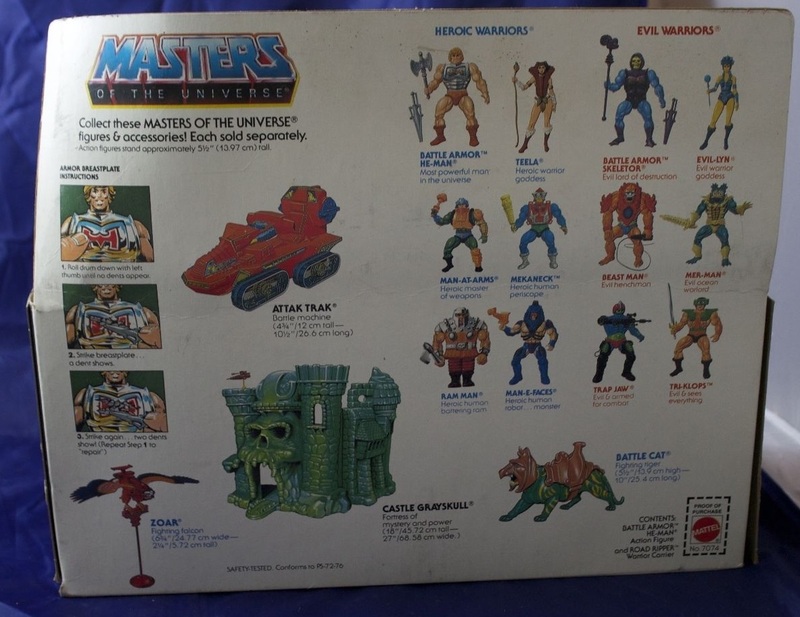 I acquired a number of slight variants of BA He-Man. 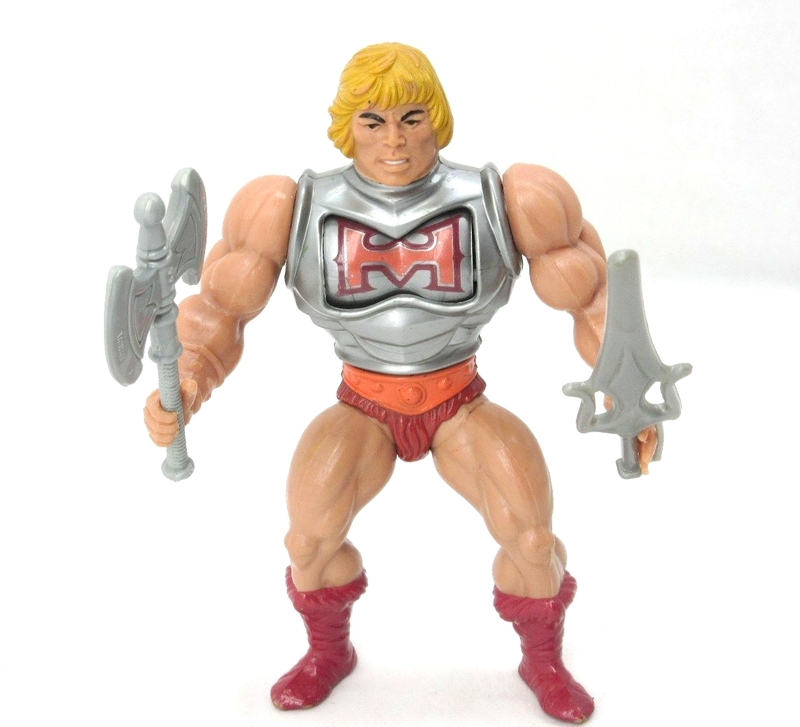 One that sticks in my mind is the French produced version (French versions often featured different colours at the best of times), on which He-Man’s hair was a much brighter yellow, his chestplate “H” more of a salmon colour (as mentioned in the bog), and his belt a much more vibrant orange. 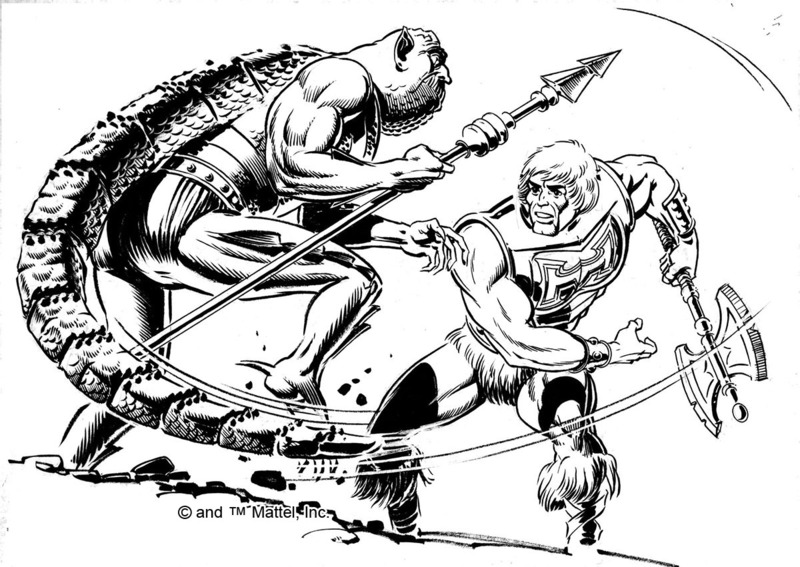 I recall his trunks and boots were a different shade as well. 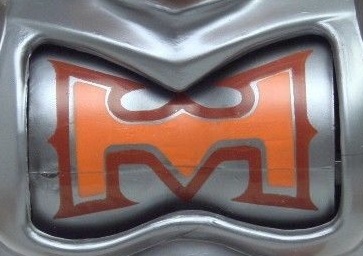 There were a few other minor variants too, mostly concerning different shades of the “H” and belt. 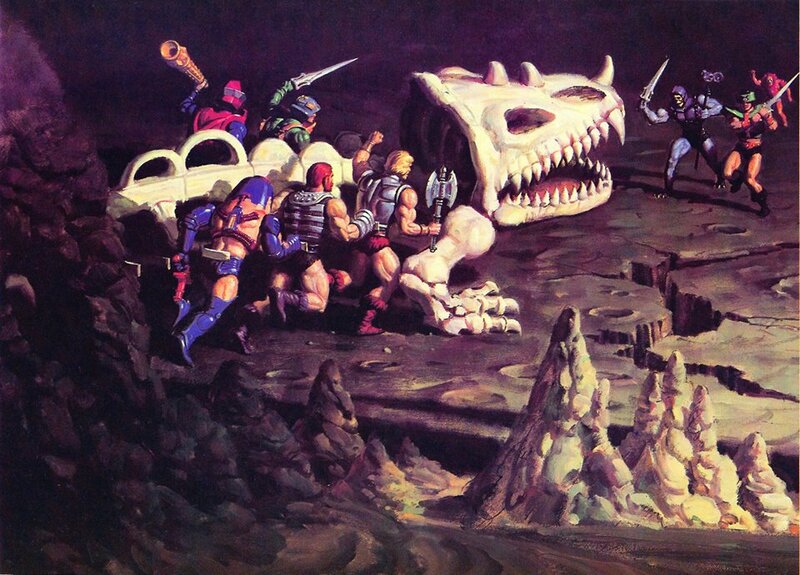 Some of my BA He-Mans had the original hollow head, others had the hard rubber head (but not solid, “shiny” version as used on FF He-Man). 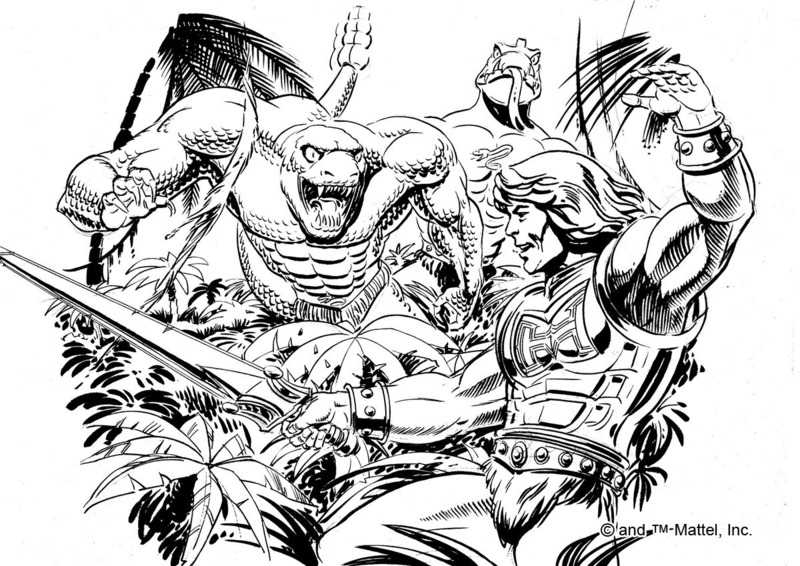 The sword can be found in the original grey and, much rarer, in a semi-metallic silvery shade. 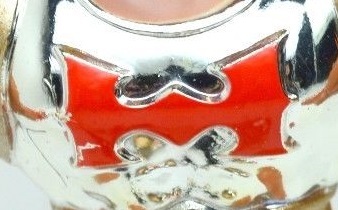 I’m not sure if the ax also would have come in this silver, as my example had it missing. 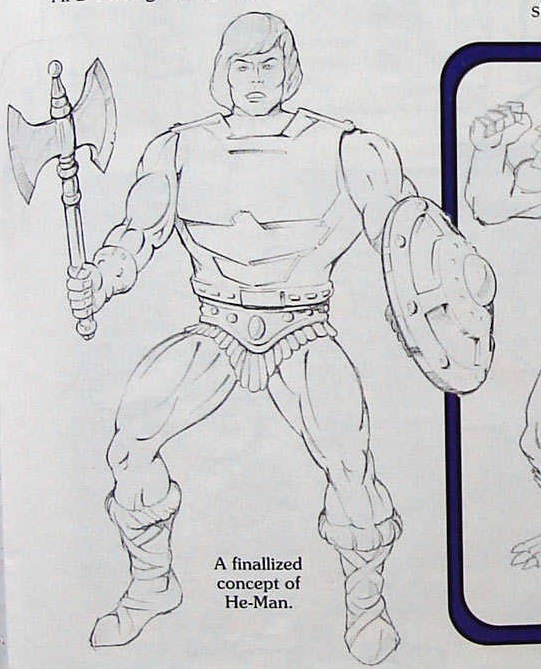 I’ve always thought it seemed a bit “clunky” carrying both sword and ax, the shield would have been better… but that might defeat the point of wearing Battle Armor? 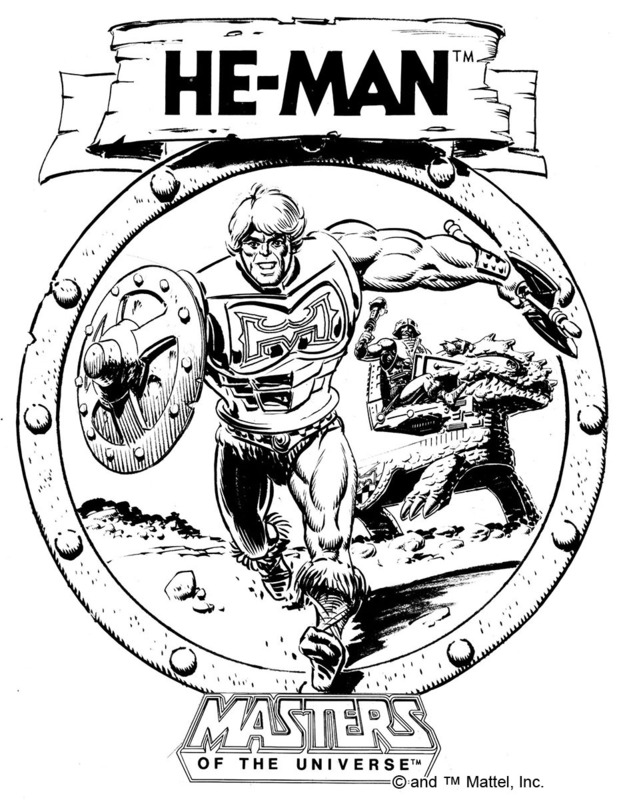 Regarding this being the first He-Man to have the “H” emblem, as well as maybe a vague attempt at branding (as the blog mentions, it appeared in various forms on later variants and various vehicles), I wonder if it was also a move to try and get away from the Iron Cross-like emblem of the original, which some debate has controversial connections historically (it actually pre-dates its use in WWI). 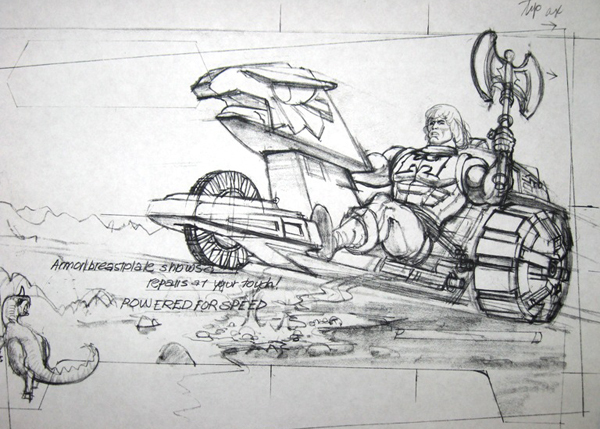 I understand this to be the reason why after very early releases, the 200x also chanced the design on He-Man’s armor. Great thoughts! 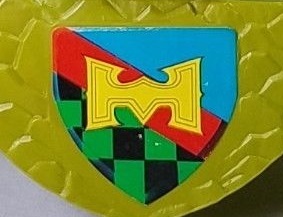 I’m not sure if they were moving away from the cross because of controversy or because of a desire to make a symbol they could claim ownership over. 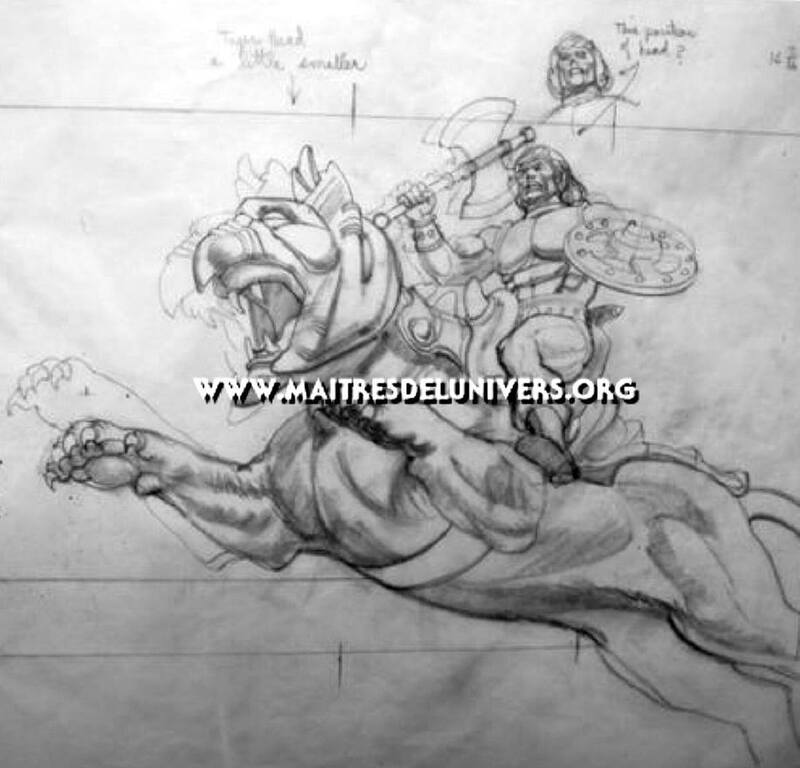 The cross was inspired by the Knights Templar, according to Mark Taylor. 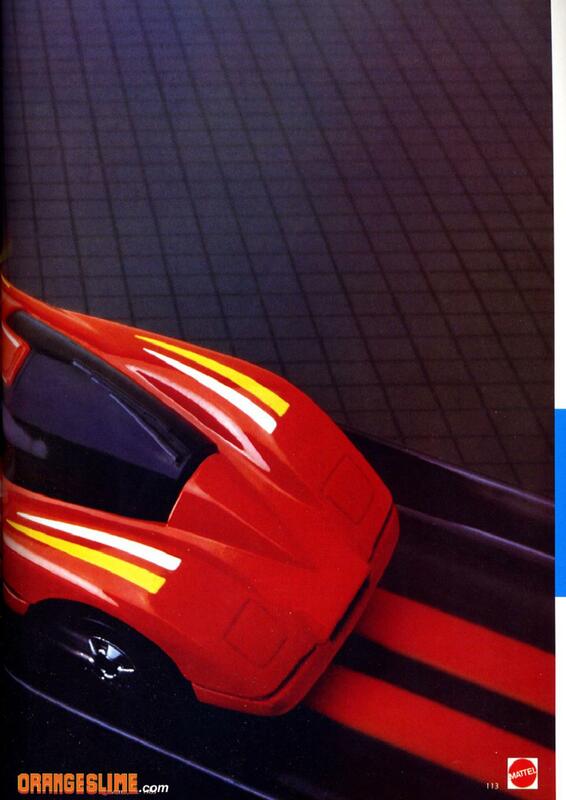 Maybe not as controversial in 1982 as it is today! Hey, if you start a blog, let me know! Happy to read it. 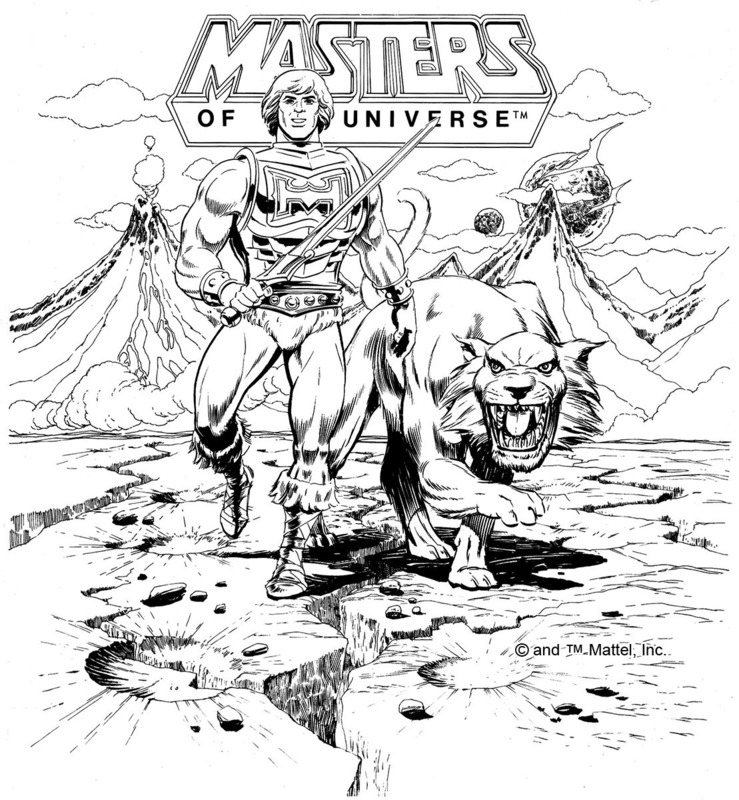 When I was a kid, I had my sister’s He-Man toys from a very, very young age..maybe 1…and didn’t get any of my own until much later. 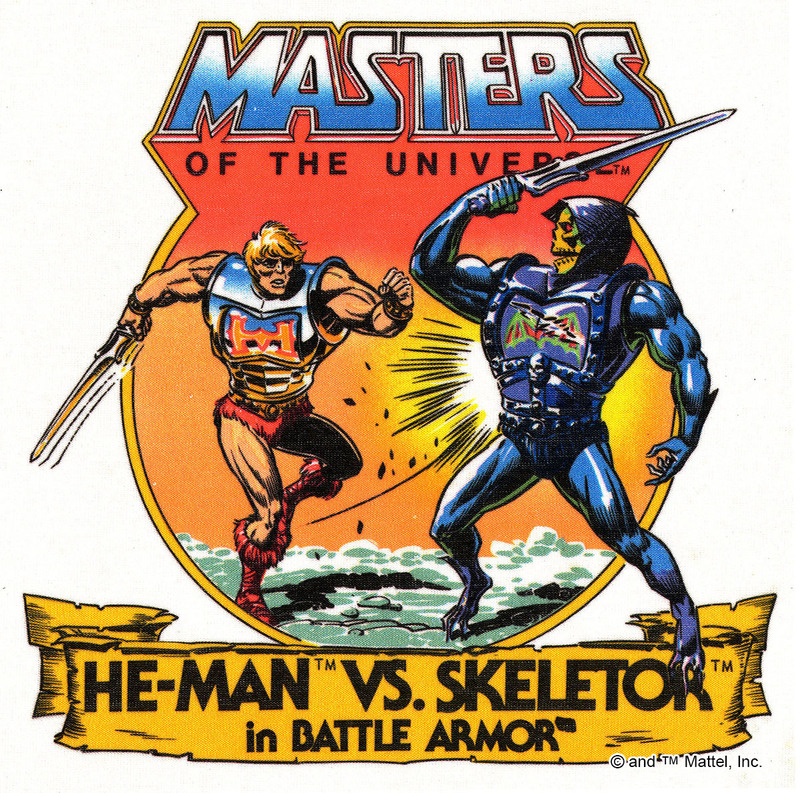 The main ones were this He-Man and the matching Skeletor and I thought, I still do, the action feature was just about the coolest thing I’d ever seen. 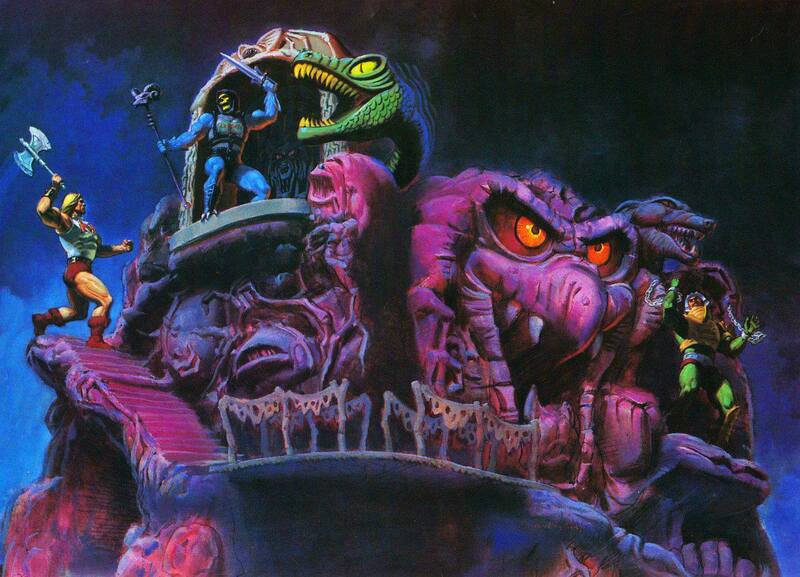 It was so perfect for these guys. 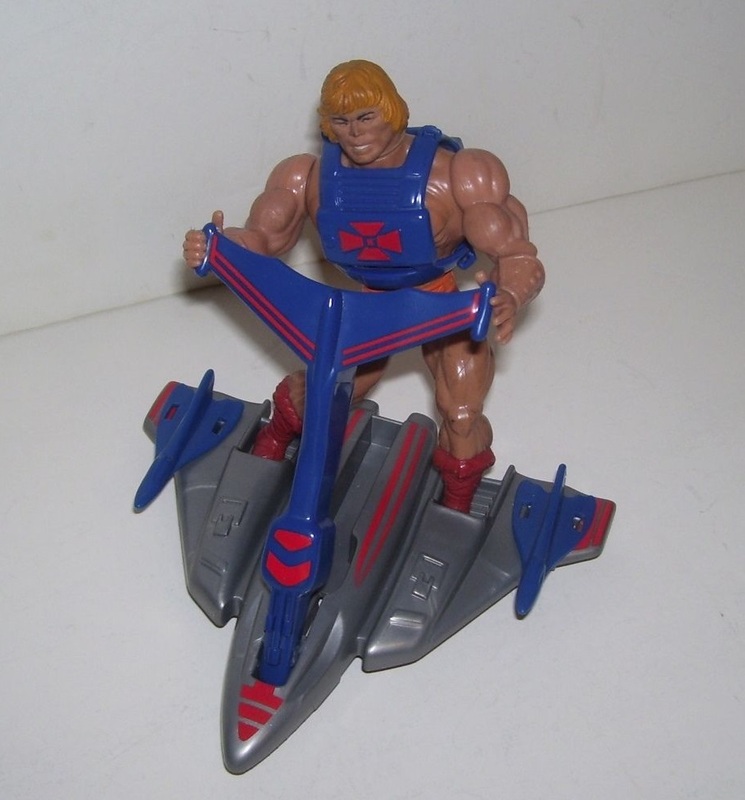 I often wondered why every toy didn’t have some version of it. 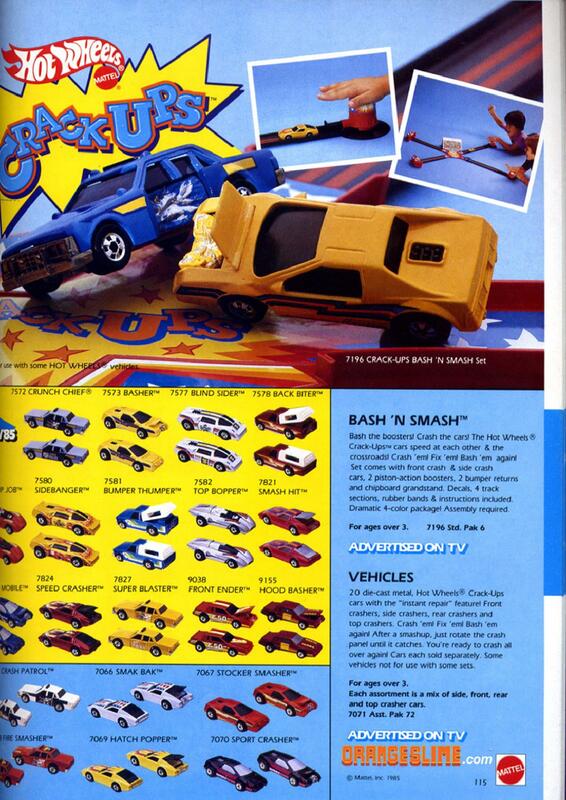 Ripped clothes on my wrestlers, bruised shells on my turtles, I thought this was the pinnacle of play and every toy should have it. 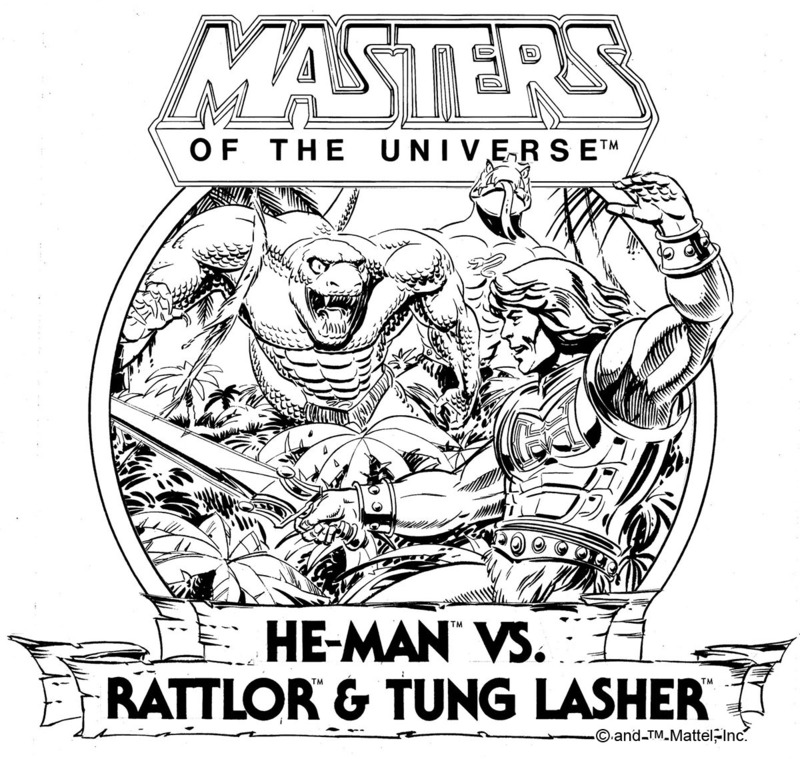 Reading this made me remember just how cool it was, and how fun, I’m currently putting together a fresh set of the vintage toys for myself and after reading this decided I need to get the Battle Armor versions as well, this time around I found myself more attracted to the toys I missed out on but these two are must haves, not complete, just as long as the action features work they can borrow weapons from their twins.